Like many people, I found TFL in my quest to learn how to make sourdough. I had a starter going and was sure I had killed it. The advice I found here gave me the knowledge and confidence to make a starter that I've been using for months now, with ever-better results. Although there is a wealth of information here, there was no one source that detailed the method I used, which was based on Reinhart's "barm" in BBA. Now that I have succeeded in making several starters, I've been thinking about making a video tutorial to walk through the process step-by-step, day-by-day. My own experience and that of others here has taught me one thing: sourdough starters don't read baking books, so they don't know how they are "supposed" to behave. I could have been spared the angst, the wasted time, and of course, pounds of precious flour, if only I had known what to expect and what to look for. I don't have the technical part of video-making worked out yet, so I have decided to do a tutorial blog. This will be a real test, as I am trying out a modified starter that I haven't made before. It's still based on Peter's starter, but I have altered the amounts, and possibly the times, to suit my own fancy. If all goes well, I will end up with a more reasonable (i.e., much smaller) amount of starter, and I will get there with much less wasted flour. For the flour, I use stone-ground rye. Nothing special, just what I got from the grocery store. My water is tap water run through a filter. Before I had a filter on my sink, I used bottled drinking water. Mix the flour and water in a bowl. It will be thick and pasty, kind of like the oatmeal that's left in the pot if you don't come down for breakfast on time. 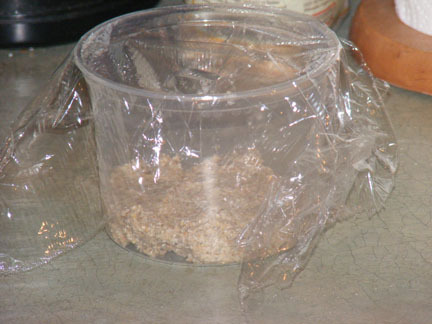 Once all the flour is mixed in, put it in a pint-sized or larger container and cover with plastic wrap. Leave it out on the counter. There should be little, if any, change in the culture from yesterday. Again, I'm not really particular about the flour. I would just recommend staying away from bleached flour. I am using AP flour for this batch. 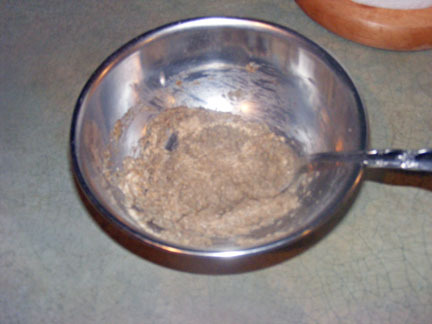 Mix the flour, water, and all of the starter from yesterday in a bowl. It will still be thick but a little wetter than yesterday. Put it back in the container (no need to wash it), press it down as level as you can get it, and mark the top of the culture with a piece of tape on the outside of the container. Put the plastic wrap back on top, and you're finished. Around Day 3 or 4, something happens that puts terror in the heart of the amateur sourdough maker: they get a whiff of their starter. When you check your starter on Day 3, you may notice a strange, and not at all pleasant, odor. And unless you know better (which you will now), you'll swear something is drastically wrong. In fact, I would venture to guess that that smell has been the ruin of more amateur sourdough growers than anything else. It's an acrid, sour, almost rotten smell, and it's perfectly normal. And rest assured, your new baby sourdough starter will soon outgrow it. So, take heart, and press on. Once it's well mixed, put it back in the container (still no need to wash), pat it down, and move your tape to again mark the top of the starter. From this point forward, keep your starter at a moderate room temperature, 70-72 degrees F. Lower is OK (it will just grow more slowly); but don't keep it at a higher temperature, or you will encourage the growth of the bacterial beasties at the expense of the yeasty beasties. Put the plastic wrap back on the container, and take the rest of the evening off. You worked hard today. And now, a word about measurements. If you bake regularly, or even if you've just been nosing around baking sites for a while, you are no doubt aware that the ingredients in most artisan bread recipes are listed by weight rather than volume. I measure by weight for my baking and for maintaining my sourdough starter. You might wonder why, then, am I using volume measurements here? Two reasons: first, I have tried to make this starter as simple to follow as possible -- no special tools, no monkeying around with the scales, just a couple of measuring cups and a bowl. And, when it comes to starting a starter, the measurements aren't as critical as when you actually go to bake with it. So for now, we're just using measuring cups. Today is another one of those days where novice sourdough starter makers often lose heart. Your starter is now coming to life, and like most living things, it kind of has a mind of its own. Up until now, we followed the clock, making our additions every 24 hours. Now, we will be letting the starter dictate the timeframe. Before you do your Day 4 additions, you want to make sure your starter has at least doubled. If it doubles in less than 24 hours, you should still wait until the 24 hour mark. If it takes more than 24 hours, be patient. Let it double. It may take another 12 or 24 hours, or it may take longer. Again, be patient. It will double. Just give it time. If your starter hasn't doubled after 48 hours, you can boost it with a shot of rye flour. Add 3 to 4 tablespoons of rye flour and a bit of water (try to keep the hydration level about where it was) and mix it up. Then wait for it to double before proceeding with the Day 4 additions. Replace the tape and plastic wrap. Then wait for it to double. It could take as little as 4 hours, or it may take more than 24 hours. This time, you can move on to Day 5 at any point after doubling. It's OK if you let it more than double; it's also OK to move on right when it hits the double mark. So, hurry up and wait. Once your starter has at least doubled, it's time for the final mix. 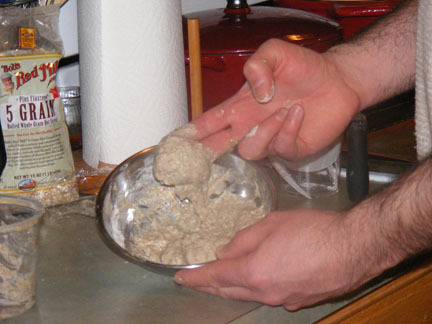 Combine flour, water, and 1/4 cup starter in a bowl and mix well. Transfer to a clean container with room for the starter to at least double. OK, one last time, cover with plastic wrap and let it sit on the counter until it gets nice and bubbly. Don't worry so much about how much it grows, just so that it's bubbly looking. This will probably take around 6 hours, but, again, don't stress about the time. Let the starter tell you when it's ready. When your starter gets bubbly, pat yourself on the back: you are now the proud parent of a bouncing baby starter! Put a lid or other cover on your container and put it in the refrigerator. Let it chill overnight, and you can begin using it the next day. By today, your starter is ready to use. The flavor will continue to develop over the next several weeks to month, so don't be disappointed if your first few loaves aren't sour enough for you. I would still recommend beginning to bake with it right away, especially if you have never made sourdough bread before. That way, you can hone your skills while your starter develops its flavor. Feeding your sourdough: If you keep your sourdough in the fridge, you only have to feed it about once a week. And you can minimize your discards by keeping only what you need and feeding it when you want to bake with it. I recommend a 1:1:1 (starter:water:flour) feeding, which means each feeding includes an equal amount, by weight, of starter, water, and flour. Start by weighing your starter, subtracting the weight of your container. Then add an equal amount of water and flour directly to the container. So, for example, if you have 100 grams of starter, you would add 100 grams each of water and flour. I generally add the water and flour at the same time, although some people recommend adding the water first and whisking to dissolve the starter before adding the flour. If you feed your starter right out of the fridge, as I do, warm your water to lukewarm (90 - 100 degrees F). After you mix in the water and flour, leave it out on the counter for a few hours, then put it back in the refrigerator. It's best if you feed your starter a few days before you intend to bake with it. Saturday morning, I take out what I need to bake bread (2/3 cup using my normal sourdough bread recipe) and return the rest of the starter to the refrigetator. Wednesday of the next week, I get out the starter, weigh it, and add equal amounts of flour and water in a 1:1:1 ratio, as outlined above. My goal here is to build up as much starter as I need to make bread on the weekend, and enough left over for my next build. It's OK if I have more than I need to bake with. If I don't think I'll have enough after a 1:1:1 build, I will increase my ratio of flour and water, maybe to 1:2:2 or 1:1.5:1.5. In that case, I will let it sit out until it almost doubles before returning it to the fridge, which might take a bit longer, as I'm using less starter relative to flour and water. Friday night or Saturday morning, I again take out what I need to bake with and return the rest to the fridge, to be fed again mid-week. This is just an example of how I keep my starter. You can feed yours more often if you bake more than I do. It's also OK to let it go more than a week between feedings. If you do that, though, you might want to feed it a few times before you bake with it. So, that's it. Hopefully I've unravelled some of the mystery of sourdough starters and given you the confidence to try one yourself. Good luck, and let me know how it works out for you! Wow, this is wonderful! I was just thinking I'd really like to learn how to do this, and had no idea in the world - and here's your article, just a couple of hours later. Thanks so much. I'm going to get going on this tomorrow, I think; I'd really like to try using sourdough for various of the recipes I've been using. Thanks for the kind words. Try it out and let us know how it goes for you. After two unsuccessful starters that molded and had to be thrown away, I managed to develop a starter thanks to you! You made this so easy and I can't believe it worked. I have a question about the hydration. I'm a new baker and this is my first attempt t sourdough. What is the final hydration of this dough? I didn't keep up with all the water changes at each step. Congratulations on your first starter! The starter should be at about 100% hydration when you finish making it. If you follow the feeding instructions, and use equal amounts (by weight) of flour and water, it will be at 100% hydration within a few feedings if it's not already. 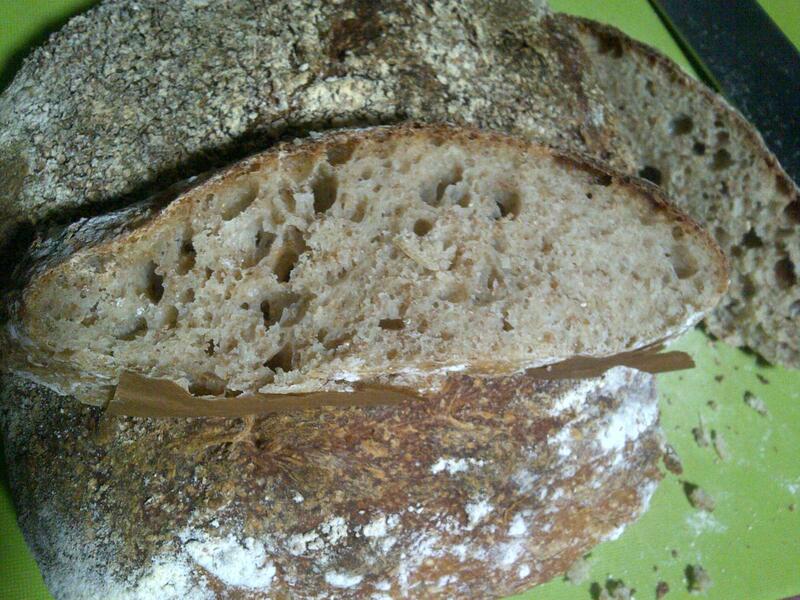 Here is a picture of my first sourdough with the new starter that I created doing this blog. For this bread, I followed Reinhart's Basic Sourdough Bread recipe (BBA), but I added 1/2 cup each of sunflower and pumpkin seeds and Bob's Red Mill 5-Grain Cereal. It's sitting on the countertop, right now! It's already growing. Is that bad? I did my Day 2 additions this morning exactly as instructed. A couple of hours later, I noticed that the level was just slightly above my tape. My first thought was that I had placed the tape a little low and that maybe the starter had leveled itself off due to gravity and in doing so, gotten a little higher where the tape is. That is not the case. I just looked at it again, roughly twenty-eight and a half hours after I first put it together yesterday morning, and I've definitely got about a 10% rise, already. This is the same thing that happened last time I tried this. One thought is that I bake a fair bit (probably like everyone else on here) so I may well have a lot of commercial yeast floating around. Not really wild, per se, but no longer in the jar. I hope that it's not just that. Anyway, any thoughts, feedback, or especially reassurance would be appreciated! Take a mental trip to the Bahamas, mon. It's all good. Mine started growing by Day 2, too. Just follow the plan, and you'll be fine. By Day 4, you'll likely be seeing a lot of growth. Remember that on Day 4, you still want to wait 24 hours, even if it doubles in less. I suspect that "Day 5" might come later on Day 4 for you. That's fine, too. Now, to go bake tonight's Dark & Soft Dinner Rolls out of KAF Whole Grain Baking. It's "beef night" and I wanted a steak-house feel. Ok. Day Three, I have followed the instructions, and things are moving along. When I got up this morning, the starter had grown to over two and a half times its original size and had clearly collapsed on itself. I took it out of the jar, split it in two, discarded half, and added the flour and water to the other half. That was about eight hours ago. Now, (about 4:30 EST) it is almost doubled in size, and I'll wait until tomorrow morning for our next step. After finding a recipe for sourdough pizza crust, I'm even more enthusiastic! I decided to give this a go. After all the trouble I'd been having I figured it couldn't hurt. Here's day three shot. I was surprised at the huge amount of growth. This is *before* it was fed after the day 2 feeding. Stephanie, that looks great! I'm sure you'll get a great starter this go 'round. Johnster, way to go! All it takes is a bit of patience and nerves of steel. Did you do the Day 3 addition? Are you waiting for your Day 4 doubling? Day 4 or 5 would be right on track to sprout yeast in the winter months. However, it sounds like you had the kind of bacterial growth in the beginning that sometimes slows things down. It won't be a problem if you stick with it, but the warm temperature you are using now, could be. The kind of yeast that you are trying to coax, grows best at a temperature in the low 80's, and does very well in 70's, but its growth rate drops sharply as the temperature climbs to the mid-80's and above. I have seen people keep yeast from getting a foothold, by exposing their starters to too much heat, especially if they're not monitoring the temperature. Remember, if it feels warm to you, then it could actually be above body temperature---yikes! Not the ideal conditions, and so the yeast may not break dormancy this way. That said, 85-90 degrees is fine (but not necessary) for the first two days. Lactic acid bacteria love warmth, and they have to get going before the yeast will start to grow. But when it's time for the yeast to join the party, it's important that the temperature not be too high. I know that the general thinking is that yeast does best at 85 degrees because it generates the most gas at that temperature, but that's only because it is metabolizing sugar the fastest at this temperature---not growing or multiplying the fastest. The reason it is burning so many calories is because it is stressed by the warmth and has to use more resources to survive. That means less energy for growth and division, which is the goal at this point. Debra, then the idea is to get them to reproduce and increase their masses before we stress them out for gas...interesting. Are You Sure it Didn't Grow? Once your starter is really going, it will grow and collapse on itself when the yeast peters out. Are you sure that didn't happen? I'd let it keep going for a while and see. If it hasn't grown by tomorrow, repeat Day 3. I agree with Debra (I'd better, she's the real sourdough expert around here) that you might want to add a bit of whole grain rye with your feeding to kick start it. Day four, Here we go! This morning, with Duran Duran belting out the classic 80's tunes in the background, I split it in two, added day four additions, and marked it with a green marker. My intentions are to stare at it all day long, waiting for it to double. If I can get motivated, occasionally I may succeed in dragging myself into my home office to start getting organized for my income tax filing...but, I'd prefer to continue staring. This is further than I got last time that I tried, which means that I'm officially sailing in uncharted waters. Wish me luck! No, I didn't touch it, but I can't imagine that touching it would be a bad thing. There should be plenty of wild yeast and bacteria in the air, in your container, and on the flour to get it to start. My biggest concern getting into this was that I had "captured" commercial yeast. (With all the baking I do, there has got to be a ton of it floating around the house. Heck, no matter how often I clean it up, every flat surface in the kitchen seems to accumulate a light dusting of flour....) And, I was (am still) concerned that I have a commercial yeast culture growing in my container that seems to be benefitting from my stare. And, would commercial yeast put the "beat-down" on any wild yeast and bacteria trying to join the party? I don't know. Anyway, too much typing keeping me from my main objective. Gotta go stare, some more. Quick question, did you try serenading your starter with Duran Duran? That and the Howard Jones I'm playing right now seem to be helping. Did You Try the Rye? That made me laugh almost as hard as the comment about flying kites! Did you try adding rye to your starter? Did it come back to life? OK full disclosure time here. I was so discouraged that 2 days ago I treated it like Wild Yeast does her starter...I removed all but 1/3 c of the "gaaarp" starter added 1/3 c water 3 or 5 tsp rye ( can't remember) and 1/3 c white. Mixed well placed in a new clean jar. Now it measures exactly 8 oz and has since that time. It has bubbles all through it and has a very pleasant smell. I think it is TOO nice. It has lost its slightly odd odor all together. So I will take out 1/2 and add a little rye and see what happens. It's been five hours and twenty-four minutes of intense staring, and I've gotten less than 10% rise (maybe only 5%)....Who knew this would require nerves of steal? Success !! Yeah....I stared and stared and sang and danced and offered sacrifices ( and no I am NOT going to tell what I offered) and it worked ! I moved it to a cooler place. Thank you Debra !! I had it reversed LOL. Cool the first days and then warm now. So it is back on the 72 degree soapstone counter and is happily climbing the sides of the container ! YEAH ! I would consider yourself, or rather your starter, to be on Day 4. Give it 24 hours, let it double, then feed it. After that, move onto Day 5 when it doubles again, which could happen in less than a day. Hang on. You're almost there! Candyboots: When you see a skin or crust forming, it's a sign that it is too warm. Use a thermometer and find a spot a little farther away from the radiator. 75-80 degrees F is just about ideal for the first three days or so. Johnster: "would commercial yeast put the "beat-down" on any wild yeast and bacteria trying to join the party?" No, they'll still take over, but on their own schedule. Commercial yeast really won't hurt anything, or change the end result. They just disappear. Stephanie Brim: Not sure how much time has passed, but if it didn't grow within 24 hours of the day 3 feed, I would go ahead and feed day 4. Not all cultures will grow and double on day 3, no matter how long you wait. One victory lap coming up ! Ok. Our house is kind of cold, lately. Here in Boston (MetroWest) it was below zero last night, and it's only sixteen degrees outside, now. So, since it wasn't growing, and the house was a bit too cold, I put it in the microwave oven overnight, never turned on, of course, but with the light on, it stays at a toasty eighty degrees. (I often use this as a proofing box.) Still, no growth. Clearly some bubbles on the surface, though. I checked with BBA, and with KAF Baker's Companion, and consensus seems to be continue feeding if it hasn't risen, enough. Did normal feeding addition (1/4 cup flour and 1/8 cup water) instead of the increased one that you would normally do on day five, and now, I'm back to my staring. Rest of the family has the flu, so I'm going to go start a fire in the fireplace, read through a cookbook, and see if it rises/bubbles/doubles anytime in the next twenty-four hours. If you think that I should do anything differently, please let me know. I'm committed to getting this one working. Johnster, that sounds like a good plan. As mentioned in a previous post, you could always goose it with a bit of rye flour. I hope your family get to feeling better. I had great growth from the rye. It tripled in the first couple hours. I waited anyway till this AM. Took out all but the required and added white and water. Took the discard and started the KA recipe for waffles for tomorrow. Only had enough discard for a 1/2 recipe of waffles but that is OK since we are just 2. So I am on my way. I hope. I don't think anything can go wrong now LOL. Johnster...try Bill Evans jazz...streaming KPLU jazz works ! I think I'll supplement with rye flour at the next feeding in 24 hours. Mine didn't do anything in 48 hours but there were bubbles. I discarded about half of the starter and fed with 1/3 cup of flour plus a bit under 1/4 cup of water. We'll see what happens. I don't really want to throw it out and start over because the smell of the starter isn't unpleasant...just extremely sour. I don't think it would be wise to give up on it now. That sounds like what's going on with mine, too. I don't plan to give up, either. I'll keep going and see what happens. Great rise on day 2 is a sure sign of leuconostoc growth, probably Lc. citreum. The problem with this organism, is that it produces an antibiotic substance that "inhibits similar lactic acid bacteria" (i.e., lactobacilli). As the pH fell in your starter, the Leuconostoc stoped growing, but the antibiotic effect takes a few extra refreshments to dilute out. This is why sometimes it won't grow and double after the day 3 feed, even if you give it extra time. Feed once a day, regardless, and you will advance the ball, even when you think all is dead. It's never dead :-) But don't give bigger feedings in an effort to flush it out sooner, because this will also dilute the acid, and could raise the pH enough that this stuff can start to grow again and put you back at square one. White flour doesn't have many dormant yeast cells, and so they get diluted out with each feeding too. Whole grain has about 200x more, so the best thing for both of you to do, is feed with whole grain flour until the yeast activates and starts to grow. You'll know when that happens, becuase the starter will begin to rise, and you'll start to detect that "yeasty" smell of bread dough or beer. But be patient. It won't happen until the starter gets very tart---the kind of sour that makes you pucker. I'll bet you're both very close now, so don't start over. Do you have your own methods for measuring the relative pH? I've got some tried and true methods for testing the acidity but would love to hear about everyones own methods. In the beginning the flour-water mixture is very bland and starts out about pH 6.0-6.5. As acid starts to develop, it will get tangy---maybe pH 4-5---and then get really tart when it drops below 4. In all my trials, I have never seen yeast appear before the pH drops to around 3.5 or so. I find taste to be more reliable than smell, because lactic acid doesn't really have an aroma. P.S. Hopefully, I'll get to post my article here by next weekend. Luv this stuff...I do have a background in R&D/Chemistry (I've owned Solomon Technologies since 93), one of my neighbors is still the Chemistry professor at ETSU. I've seen nothing but good remarks from the best of folks about your tests. Pamela, tell me a little more. Is this the reading before or after feeding? What flour are you refreshing with, and what temperature are you keeping it between refreshments? Is it a firm or pasty starter? I'm refreshing with KA bread flour and keeping them in the refrigerator at about 40 degrees (they are very active even in the refrigerator). Both are about 3 weeks old--it took them about 11 days on the counter to get active. I refreshed them on Tuesday of this week. pH reading is the same before and after feeding; it is always the same--has never changed from day 1. Starter 1 is a little firmer than starter 2, but I would say both are pretty firm. Okay, very good---we have a lot of lattitude to work with :-) Reviewing these two formulas, I see that American Pie is maintained at 100% hydration with bread flour, and the WGB is 75% and whole wheat. From your post, it sounds like you are using bread flour for both, and maybe have even changed the hydration if #1 is firmer than #2. Am I understanding that? It really doesn't matter how a starter was initially created, it's how it's maintained that determines its character. Maintaining your starters firm and in the refrigerator will keep them very mild (which some people prefer), so the first thing you'll want to do is move them to the counter. Start with the American Pie one, and leave the other in the fridge for now. Sourdough lactobacilli prefer high hydration and warm temperatures. You don't want it too warm, because that's not good for the yeast, but too cool reduces the populations of bacteria. Once, you get it the way you want it, I think you'll be able to store in the fridge when not in use, but you want to get away from refreshing and maintaining in the cold. Also, you may want to read the 'Lactic Acid Fermentation in Sourdough' thread, especially this post to Pat (proth5) and exchanges with Eric (ehanner). Yes, I am now feeding both with white bread flour, and #1 (American Pie) is slightly firmer than #2. After I feed them both are pretty much the consistency of bread dough, but after 4-6 hours on the counter and they have doubled, #1 is a bit firmer than #2. Starter #1 is also going crazy in the refrigerator--everyday the thing is practically blowing its top off because it is expanding so rapidly. So I'll take #1 out of the refrigerator, increase its hydration, and leave it out at room temperature for a week or so, feeding it each day, and see what happens. Thanks so much for your help. I will keep you posted on how things are going. Again, I really appreciate all the information in your post. I took 4 ounces of starter #1 and mixed it with 12 ounces of water and 12 ounces of bread flour and will let it sit on the counter for a week or so. It is a lot looser now. Am I suppose to discard all but 4 oz. each day and repeat the process? "Starter #1 is also going crazy in the refrigerator--everyday the thing is practically blowing its top off because it is expanding so rapidly." Oh, thanks so much. I refreshed at noon my time and don't see any action yet, but I will take note of each day's peak and fall. Tomorrow I'll scale the thing down too. I really feel so relieved now; I just couldn't figure out what to do and I was so sick of seeing no progress on my pH paper. Thanks, again, so much for the help and I'll keep you informed. Hi Debbie. I refreshed yesterday at noon (100% hydration) and my "little volcano" doubled in 6 hours and had overflowed its banks (more than tripled) by this morning. No measurement change on pH yet. I'll refresh at noon again today (will only save 1/2 ounce this time!) and up the hydration a little. More later. Be sure and use a container at least 4x the volume of your refreshed starter. It will (and should) at least triple between feedings. Sounds like it is right on track in that regard. I'm not sure how long it will take for the populations to shift and the LAB to repopulate, but you could try using a whole grain flour for one feeding to add some back in. And then wait until it starts to fall before feeding again. This will give the bacteria a little more time to catch up. I got the message about using a 4x container this morning when I saw the "lava" flowing onto the counter! I'd like to try the whole wheat flour feeding. I grind my own whole wheat with a Nutramill grinder. I also have some diastatic malt powder on hand. Do you think I should use my own flour or go out and purchase some for my starter? I plan to convert one of my starter to whole wheat at some point. The only other wild card that I can think of regards my source of water. We live in an unincorporated portion of Santa Rosa and are on a well. The water we drink goes through a reverse osmosis process. Do you think this water is OK or should I buy some bottled water for my starters? Thanks, again. You are a terrific help. My experience has often been that you'll notice a shift more or less all at once, but not necessarily right away. 3-7 days generally. But I also know from the literature that cultures change and stabilize faster when the temperature is going down than when it is going up. OK, i'll feed my volcano with whole wheat flour tomorrow. I'm excited and keeping detailed notes on what I'm doing and what its result. I replenished starter #2 this morning and am going to leave it out of the refrigerator too. I've got plenty of bread batches and recipes to make that don't need a starter, so being without the finished mother for a week isn't a problem. I could keep the starter in the garage, which is about 50 to 55 degrees instead of the counter. What do you think? Is that a better temperature? I have faith, patience, and will hang in there. More later. Well it is day 3 now and I only got a doubling out of yesterday's feeding. I aerated it this morning. Should I let it go another day before feeding or feed as usual? I'm surprised it slowed that much. Tell me what the feeding was yesterday in terms of starter, flour and water amounts. About how long did it take to reach peak, and was it completely collapsed this morning? Does it taste tangy or sour? Don't skip feeding. It needs at least one feeding a day when kept at room temperature to keep it in good shape. Depending on answers to the above, we may need to adjust the refreshment rate or add a feeding. Neither collaped; #1 is slightly tangy; #2 is bland; both doubled in about 6 hours and then stayed at double overnight. I aerated #1 but have done nothing with #2 yet. #2 is one day behind #1. But since I moved them to the water heater closet, they are really bubbling. I refreshed both starters at 11am with 1:3:3 ratio (starter:flour:water). I fed #1 with whole wheat flour and #2 with bread flour. At 4 hours and a temperature of 75 degrees, both starters show 50% growth. At 5 hours and a temperature of 75 degrees, both starters show 150% growth. At 6 hours and a temperature of 75 degrees, both starters have doubled. At 11 hours (I can't stay up to watch anymore tonight!) and a temperature of 75 degrees, #1 has more than doubled, while #2 seems stuck at double. At 15 hours and a temperature of 72 degrees, #1 is tripled and #2 is still stuck at double. At 19 hours and a temperature of 72 degrees, #1 has collapsed to double and # 2 is now tripled. AT 21 1/2 hours and a temperature of 75 degrees, #1 is steady at double and #2 has now collapsed upon itself and is back to double. What do you think Debbie? Should I feed both the same stuff at 11am again? what you did yesterday is fine for now. There really is no need to work with both at once. But if you wish to, then you don't want to treat them the same or you'll just end up with 2x the same starter for twice the effort. Keep feeding one whole wheat and the other bread flour. I think the wheat will get more sour in the long run, because whole wheat sourdoughs just do. But I think the goal here is to create a general-purpose white sourdough that you can push to make sour bread when you want to? The next step is to find a basic bread formula that promises some sour tang, and use it to test your starter's progress. Do you have such a formula, or Leader's Bread Alone, or Hamelman's Bread...? I don't have Leader's or Hamelman's books, but I am a current tester for Peter Reinhart and have a recipe that I've managed to make sourdough bread out of in spite of my starter problems I've been able to achieve sourness with a non-sour starter via many days of fermentation in the refrigerator--one day for the starter, one day for the dough, another day for the loaf proofing). As far as the Reinhart formula is concerned, is it supposed to be sour? Not all naturally leavened breads are designed to be. Look for recipes that are described as sour. Leader and Hamelman both have recipes that are tangy by design. In fact, Leader has one titled San Francisco Sourdough, and Hamelman has "Vermont" Sourdough, among others. It's a mistake to assume bread or starter should be sour because it's made with starter. It's the process and method that determines that. Not even just the way you keep your starter, but what flours you use and how you manipulate the dough with time and temperature. It all plays in. is the sign of time to feed the collapse? When it collapses after tripling, should I feed immediately or wait for a few hours ...? In your shoes, I would let them collapse a bit before feeding again, to give the LAB more time to catch up at this point. Feeding at the peak favors yeast because LAB have a longer lag time than yeast--i.e., yeast start to grow first for a time, then LAB start to grow, then yeast stop growing, while the LAB continue on for a time. You can take advantage of this disparity by feeding sooner or later, depending on what the goal is. I prefer lighter, milder breads, so I feed earlier. But you'll want to give the LAB a little more time. And this morning: My two starters are behaving the same--doubling in about 6 hours, tripling in about 11 hours, and collapsing back on themselves at about 16 hours... I checked their pH and smell this morning; think they smell a little less like "paint" today and think maybe they have moved down to a solid "5" now. Sounds like they're moving in the right direction. I have been reviewing Leader's levain and San Francisco Sourdough process. It all makes good sense from a scientific point of view, so I want you to start maintaining one of them (whichever is more sour at this point) more the way he suggests. Mix your flour 3 parts bread flour to 1 part whole wheat. Hi Debbie. While you were replying, I was feeding, so I've added a 3rd starter made from discard of Starter #2. Temperature is pretty steady in the water heater closet: 75 degrees during the day and 72 at night. Starter #3 fed on 1:1:1 has nearly doubled in 3 hours. The other two starters are are at 150%. Everyone seems happy in the water heater closet. All three starters are tripling and then collapsing. And, all three starters are still at a pH of 5 and bland-smelling--definitely nothing acidic in the air in any of them. Oddly enough, Starter #3 (the kind-of-newest-one) is much more soupy than the other two, but I'm not sure what that means. Lactic acid doesn't really have an aroma, so smell is not a good indicator of sourness. I have started toward making Leader's SF Sourdough tomorrow. I made the levain yesterday, and the poolish is bubbling away today. If my mild starter can make a tangy bread, then I'll have you try this formula. In the meantime keep feeding with the bread flour/whole wheat mixture in a 1:1:1 ratio. Taste it before feeding. That's when the acid will be the most potent. I just tasted them and Starter #3 definitely tastes tangier than #1 or #2. Maybe I'm getting somewhere after all. I wonder why the pH paper doesn't show any change? I'll test them again tomorrow. I tested other things with the paper and it seemed to work, so I'm a little surprised that I can't see any change with the starter. Should I buy some different paper, or is there something better to use? Well, San Francisco Sour- bread dough is fermenting, so we shall see. I haven't tried this formula for about 5 years. I can only hope I'm a better bread baker this time around ;-) So far so good. The levain (stiff, 10 hours at 70F) was fairly mild, but the poolish (pasty, 24 hours at 77F) was very beery and sour this morning. It added a definite twang to the dough from the get-go. I tasted Starter #3 a few minutes ago and it is even more tangy than yesterday, so I'm going to start a starter for SF Sourdough this morning. Thanks for your continuing help on this project! What should I do now? Continue keeping these starters at 75 degrees and feeding them daily for a while, or??? I think you'll burn yourself out working with 3 at a time. Unless you want to bake 100% whole grain breads, I'd scrap the the ww, and park the white one in the fridge for now. You might like to keep that one as your mother (or the Leader-style one, your choice). I would continue to feed the Leader one daily for another week to see if it is stable and can remain vigorous this way. But do go ahead and bake with it if you like. Let me get this bread baked off and see how it turns out. I have divided the dough and it is now resting, getting ready for shaping. It's very airy and bouncy, so I'm hoping for light loaves. If they are sufficiently sour, I want you to try this formula, and I'll walk you through it since you don't have the book. We can start a new thread, and maybe some of the others will join in and bake along :-) Sound like a reasonable plan? I started my SF Sourdough starter with the Leader (#3) this morning. I'm pretty sure changing the feeding to a 1:1:1 ratio and making the flour 3 parts bread and 1 part wheat was sine qua non yielding tanginess. So are you suggesting giving #3 one more week of daily feeding and keeping it in the water closet? As for the other two, I think I'll keep the whole wheat (#1) and feed it 1:1:1 for a few days and see if it turns tangy, and just chuck #2. I'm anxious to hear how your bread comes out. The method I'm using will take at least 2 days, so the earliest I'll bake is tomorrow, but more likely it will be on Sunday (I've got about 5 things in already process that I'm testing). I think with the 1:1:1 rate you could bring it out to room temp. Wow, I got incredible oven spring---I swear it doubled in size after going in the oven. After it proofed to at least 1 1/2x. So triple what the dough started out after shaping. I wasn't expecting that from this formula. I'm going to wait until tomorrow to cut it, so will report on sourness then. The waiting is always so difficult for me. Days of work only to get it in the oven and then more patience is required! It's almost to much to ask of a mortal. Isn't oven spring wonderful! It really makes one feel great and successful. Room temperature it is on my babies; I'll go retrieve them now. "I could keep the starter in the garage, which is about 50 to 55 degrees instead of the counter. What do you think? Is that a better temperature?" Absolutely not :-) Sorry if mentioning desem in this conversation was confusing---the reason a desem starter is kept 50-65 degrees is to keep it mild. But you're wanting sour, remember? The game plan is dial the temperature up in order to give the souring bacteria a chance to return. They like it very warm (90-ish). But if we indulge them too much, the yeast will drop out and you'll lose your leavening power. So you need to keep your starter in the 70's---mid to upper 70's if you can. That's a good compromise. Now Isee what you mean about your desem--wanting it mild, and why you are keeping it at that temperature. OK, I'll keep my starters warm--at night the temperature of the kitchen (where they are living) drops to the low 60's so I'll find a little warmer spot for them so they'll be in the 70's all the time. I'll start another batch of starter with part of one of them today so I can bake tomorrow. Today will be their 1st whole wheat feeding! Also, I see what you mean (at least I think I do) about things happening all at once: After I refresh, nothing happens for about 4 or 5 hours, and then all at once the starter doubles. This is really a lot of fun! "Also, I see what you mean (at least I think I do) about things happening all at once: After I refresh, nothing happens for about 4 or 5 hours, and then all at once the starter doubles." Well, that's not exactly what I meant, but you're right---there is a longer lag time with sourdough than with commercial yeast. What I meant was that it will behave basically the same every day with subtle or no improvement, until one day it suddenly behaves noticeably different (significantly higher, faster rise, more fragrant, etc). Something that indicates a more dynamic change in the populations, maybe even shifting of dominance to a different organism and striking a new equilibrium. I've found them a new home: on top of the water heater, which is in a closet inside the house and holds a constant temperature of over 74 degees! Just be sure it doesn't go over 80 degrees inside your starter. This may not be necessary if daytime temps are in the 70's. Thanks for the photo---it reminded me that you increased the hydration yesterday. That may be why it only doubled. Soupy mixtures just aren't going to achieve the same height as thicker ones. That's okay. It's physics. I'll monitor the temperature and make sure it doesn't go over 80 degrees. But I'm really excited about finding this location, esp. if it holds a pretty constant temperature. I can put a shelf in there and it will be a great place for proofing. I think it is pretty cost effective to grind your own wheat berries. I purchased a Nutrimill grinder several years ago and think it is a very well made mill that produces great flour. Plus it is a lot of fun to experiment with different types of wheat berries and other grains. I've really just begun to branch out and try things other than what I can get from Bob's Red Mill. I;ve got buckets full of grain lining one side of my laundry room. Stored properly, I think the stuff last almost indefinitely. I think the way to go is to find other people to share grain with; it seems like 25 pounds is what you need to buy to get a decent price. I also taste the starter from time to time. Recently, I discovered that in order to better evaluate the sourness of a starter it is important to get the starter at the back of the tongue/mouth. 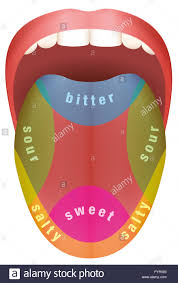 Since the taste of a starter is not something we relish, most tasting is done at the tip of the tongue, then it is spit out. BUT, sour is perceived at the back of the tongue. In my experience when (sour tasting) sourdough bread is eaten, the bread must be chewed awhile and then the sour flavor is sensed at the very back and rear sides of the tongue. Give it a try. Put a small amount of starter on your index finger and place it on the side and at the back of your tongue. UPDATE: a better way to get a wet starter into the proper is by using a pipette or eye dropper. Day 6: fed as per usual, 1/4 cup KAF bread flour and 1/8 cup spring water. Report: smell is still kind of sour. Fewer bubbles than before, and, still, no sign of rise. Keep feeding with whole grain flour, and Mother Nature will take care of the rest. Unlike Debra, I would never accuse you of being over the hill, but I do agree that you are almost to the finish line. Just keep a stiff upper lip and press on! I was told that about my dreams, but I'm sure it works for sourdough, too. I'll keep you posted. If this one doesn't work I'm going to start one which I feed with all rye for a few days, then start going with the white flour to see how that does. If you remember mine was full of tiny bubbles but not growing. I added the rye feeding and it took off. It had a lovely yeasty smell. I then took the discard and added the waffle ingred. to it from the KA recipe last night. And I fed the original starter with the white flour and water. All is well everywhere. The waffles were MARVELOUS! Perfect. crisp brown light...you name it....gone ! The original starter doubled right away. I am going to feed it again today and am leaving it on the counter as I plan to make bread with it tomorrow. So as Debra and Phyl have advised....feed with rye and keep the temp cooler at this point. It will grow like crazy. As long as there are bubbles all is well. I got out PR's book and looked at the recipe for barm and the 1st soudough loaf I want to try. He said if you tap the culture on the counter and it immediately falls it is ready. So I tapped and it fell. He says to double it and then let it get bubbly and then fridge it and then use tomorrow to make a firm starter. So that is what I did. I weighed and I had 10oz of wild yeast culture. I added 5 oz white bread flour and 5 oz water from the tap. ( I forgot to use bottled...hope it doesn't matter at this point). Stirred and have a lovely creamy 2c about of barm. I will wait till it bubbles and then place in fridge . Tomorrow he says to make a firm starter and then fridge that. Boy this takes forever. Hope I can be patient enough to keep this up. I am actually looking forward to saving the tossed out stuff....those waffles were so fantastic ! trailrunner, congrats! You're there. It sounds like you are planning on following PR's recipe for Basic Sourdough Bread, which I think is a great place to start. If your starter is bubbly and lively, you will get a very nice bread. And your starter will continue to improve over the next month or so, so those waffles and loaves will just get better and better!!! I'm trying to decide whether or not to feed it now since it is over double. I'm so excited. Stephanie, depending on what day you're on, you might be OK to go ahead with the next feeding. Remember that your starter can't tell time, so going on a strict 24-hour basis is somewhat arbitrary. If you are between Days 3 and 4, I'd wait the full 24 hours, even if it drives you nuts. If your between 4 and 5, go for it. I did what Phyl said and went ahead and fed. It was evidently the right thing to do...my starter does NOT know how to tell time...it has no hands ! Anyway...the feeding that I did at 10:30 AM today has almost doubled !! WOW...I am on a roll. This is so fun. Whodathunk?? I am fridging it as now and will make the firm starter in the AM> I bet that everyone will have the same outcome. I am making the simple sourdough to start. Will see what variations I can come up with also. Wild Yeast has some great recipes on her site. I went ahead and fed 1/4 cup starter with 1 tablespoon of rye flour, 7 tablespoons of white flour, and 1/4 cup of water. I'm going to wait for this to double, which should happen in 24 hours, and then I'm going to feed again. I'm going to do 1/4 cup starter, 1/3 cup water, and 1/2 cup flour mix (1 tablespoon of rye, then fill up with white to 1/2 cup). This is excellent! I'm currently using a starter based on commercial bread yeast, but once I get the hang of it I will try a proper sourdough based on wild yeast. Day seven: I fed it, today, with the rye flour as suggested. (1/4 cup flour and 1/8 cup spring water.) It seems thicker than with the bread flour. This morning, pre-feeding, there were some bubbles on the surface. Maybe a dozen, or so. Very slight rise, too. Perhaps between 5-10%. Thank you for the continued support and suggestions. Sooner or later, it'll come together! "pre-feeding, there were some bubbles on the surface. Maybe a dozen, or so. Very slight rise, too. Perhaps between 5-10%." This sounds encouraging. Maybe the sourdough gods are smiling on you today. do any of you NOT use rye flour? I really am fond of rye, so I was wondering if it would hurt to just use regular whole wheat flour (I grind myself). becky, the rye is just used to give the starter a jump start, as it has more natural yeast than wheat flour. If you notice, only the first day calls for rye flour. By the time you are done, you really have a wheat starter. Ok. Thank you. I am off to grind up some rye and get a new starter going. Mine is doing well, but it's taking 18 or so hours to double yet. I'm not going to bake with it until it starts doubling in 12 hours or less I don't think. It smells very bready so I think I'm on the right track. Day 8. We have MANY bubbles! Ok. Fed 1/4 cup bread flour and 1/8 cup water, and now back to the stare. Question: which day do I "pretend" that I'm on? If it doubles by tomorrow morning, should I advance to the "3/4 cup of flour and 1/2 cup water" of the day 5 feeding? ALL of you have been GREAT though this! I would have added this to my mulch pit a while ago if I hadn't gotten the support and recommendations that you've offered. Thank you, again. I am so happy for you---I think the sourdough gods were testing you to make sure you were serious ;-) And you passed the test. Johnster, you are sooooooo close! I would say "pretending" to be between days 4 and 5 is a good plan. Watch for it to double, then feed it the day 5 feeding. Then get ready to bake!!! Funny thing: I've been focusing so much on getting a sourdough starter going, that I kind of forgot that I'd get to return to baking once it's worked! :D Rather than feeling like what I'm doing is "baking", this part reminds me of buying my first set of Sea Monkeys as a boy. Alright, getting ready for a double, then, viola, it's Day 5. Day 9, almost tripled in size, moving from "barm" to "starter"
Very nice rise overnight. It was puffy this morning. Smelled sour and yeasty at the same time. I'm DYING to try the Roasted Onion and Asiago Miche from the BBA. How 'bout a picture of your first SD bake? When I bake it, I'll post the pic! what did you make from the discard :) ? I used mine to make the KA waffles. They were great and the discard LOVED the buttermilk. I have been storing my barm/starter ( not sure what to call it) in the fridge and have been letting it alone. It has cont . to have bubbles and smells great. I have not added anything to it. Just removed 2 different amounts for 2 different recipes that I am doing from PR. I am not going to replenish it till I am ready to use more from it. Trying the suggestion of leaving it alone for as long as 3 weeks ( on another waste not...thread) and see what happens. I didn't think it was ready, yet. I didn't think it was ready until after the 3/4 cup flour and 1/2 cup water addition, which I did this morning. Now, I'm waiting for the bubbly look, and then into the refrigerator, it goes. If I understand correctly, I will be able to use this for sourdough bread, after it's been in the fridge for a couple of day. Where did you get the KA waffles recipe? I have their Baker's Companion and Whole Wheat Baking books. That sounds worth a try! Johnster, I was going to do you a service and look up the KA sourdough waffle recipe, so I did a search on TFL. It came back with a bunch of hits, which led to a bunch of threads with a bunch of recipes. All of them differnet. All of them claiming to be a (the?) KA sourdough waffle recipe. So, do a search and peruse the recipes to find one you like. haha...I went to the "horses mouth" ! Phyl, thank you for looking for me. There is so much available on this site that it's overwhelming...I have a hard time just keeping track of the threads that I'm posting on, let alone all the new ones. That recipe looks like the bomb! I know what we will be having for breakfast this weekend. Johnster....my 1 1/2 yr old will be 34 !! this weekend...he still loves his waffles.Make a topping out of sauteed apples ,sugar ,butter w/ cinnamon...goes really well. The top is fairly bubbly, but only about a 10% rise, so far. It doesn't look like your picture, and I did the mix about six hours ago. Johnster, you are on Day 5, right? If so, as long as it's bubbly, you're OK. Go ahead and stick it in your fridge and start using it as soon as tomorrow. You will build a starter from this, so it will have plenty of time to come alive. Affirmative, this is "Day 5"
Ok. Into the fridge, it goes! It doesn't look anywhere near as good as your photo, but here goes nothin'! is just more photogenic than others! just not warmer than 80F. I realize this thread may be dead, but I was wondering if you had any advice for me-I live in Thailand and my house is always in the 80's. Thank you for your help. My starter is extremely active and hungry, despite the high temperatures-however hot season is coming and the average temperature will rise into the 90's & higher most of the day, with high humidity. Having this information helps give me a "head's up" so I can start thinking about how I am going to help my culture survive. Maybe I will keep it in the fridge most of the time except to refresh or build up to make bread. One thing I've noticed, though, is that my starter takes about 15 hours to double regardless of the fact that I'm on something like Day 14. It's healthy because it has the beer and bread smell, but it's just kinda slow. My kitchen is also cooler since it's been cooler here lately, so that could be the reason. I'm feeding it once every 24 hours with 1:1:2 by volume. The two loaves of bread that are rising right now are done using the 1-2-3 sourdough method. 1 part starter, 2 parts water, 3 parts flour, all by weight. The first was given a preferment: 100 grams starter, 100 grams water, 100 grams flour. Went very well and I had good bubbles by 6 PM, but I waited until 9 PM to mix up the final dough. That dough sat in my fridge until 10:30 this morning. IT's now out and has been folded twice so far. Probably going for one more fold before I shape for baking. The other loaf was mixed from today's leftovers into a 1-2-3 loaf directly without a preferment. I'm seeing how each turns out. Looking into my oven right now would provide you with the sight of two very nice sourdough loaves getting all toasty. I am seriously indebted to you for writing this, gaaarp, and being so encouraging. I dedicate the eating of my first (and second) sourdough breads to you! I'm so excited. I know to let it completely cool, so that's what I'm going to do. Very nice first loaf!! Report back with crumb and taste results.. I'm really happy. I mean, this is the best loaf of bread I've baked, ever. The taste is sour. Would probably be REALLY good with turkey and swiss. Needs more salt, though. I need to tweak my ratio. I'm really happy with it, but it really needs more salt. I put as much as I would put in a loaf of normal bread and didn't really realize that wouldn't be enough. I'm going to go with at least 2% by weight next time since I figured that the regular loaf would take 1.5% for my taste. These doughs were right on 600g minus salt. Tonight I'm going to feed my starter and mix up the excess to use tomorrow for a 4 loaf batch. 1800g or so. Should be fun. I really need to get myself a good container for rising large batches of dough. My starter has some REALLY good tang. I think I'm going to leave it out for at least 3 more weeks to see if I can develop it into an even better flavor. The starter itself is pretty much doubling today in 6-8 hours. I have been leaving mine in the fridge untouched for a week. I took it out today and it is lovely and mild. I don't like a sour taste so this is working well . I took out one cup and added 65 g water and 65 g unbleached to it. Left on the counter in a cool place and it has doubled. The funny thing is that the discard is sitting there waiting for me to add stuff to it to make waffles tomorrow...and it has doubled too ! I haven't done anything to it. So I am well pleased with how active it all is. I plan on feeing my starter 1x a week only. Will keep you posted as to how that goes. Here's my tip, because mine is now...well...pretty happy. Starting on day 2, when you're supposed to add the normal flour, stick a little rye in. Do this until you get to the end of day 5, when you can either keep feeding the beasties (which is what I do now, with 1/4 cup water and 1/2 cup flour) or stick it in the fridge. This was mentioned up a ways, and I think that's what got my starter through. It's now a bouncing baby much like my little girl, only a bit less demanding. It really is rewarding to see it go from smelling as awful as it does at first to having a mild, almost citrusy tang. I love it. It makes my day. Stephanie...you are a hoot ! Finding ways to get rid of the "d word" ! Why are you using unequal parrts of water and flour to feed ? I thought it was supposed to be =. I have been taking the weight of the starter and adding 1/2 water 1/2 unbl bread flour to = the weight of the starter. Has a noce goopy pancake batter consistency. Just curious what others are doing. Go, team, go! Make that sour-dough! OK, there's my cheerleading for the day. I can only echo what everyone else is saying. It's confusing and intimidating at first, but well worth the effort. Stephanie's idea of goosing the starter with a littly rye is a good one. TR, I think what Stephanie is doing is pretty close to what you are doing. 1/4 cup water and 1/2 cup flour are just about equal in weight, so she's in essence doing what you are. Measuring is fine, as long as you account for the weight. I encourage people to start weighing at the end because I think it is a good habit to get into for baking and the best way to achieve consistency in your recipes. Can I name the team? We can be the Sourdough Starters! Feel free to groan now. Yup she is using cups...I am using grams...gotcha. I do love the weighing...never thought I would say that ! It is so much easier to get the same results time after time. I go by feel of the paste, but I weigh the final product before it goes into the dough for breads. I love to weigh, but I've got a young daughter so simplifying one thing in my bread baking is helpful. I've also finally bought Bread Baker's Apprentice, so I'm going to start going through that book and doing recipes as well, and I'll build the starter up by weight. Doing the freeform breads I'm doing now, I can just weigh out my starter before I bake, and if I have any leftover it goes into something fun...like the banana bread. Storing the starter at room temperature? I used all but about an ounce and a half making the "horses-mouth" waffles on Saturday. (HUGE hit with my wife!) Now, I've got very little starter left, and I'd like to start building it up in order to bake my first loaf of bread, this week. Should I just add 1.5 oz each of water and flour and leave out? Then, do again, a couple of times? By the way, congratulations on getting the Front-Page Photo! Excellent picture and article. That's got to be a feather in your cap! I leave part of mine out. Right now, my starter is doubling consistently at 6 hours. The thing is unstopable. Depending on how I build the final levain, the results vary from being very nice and sour to almost no sour at all. John, if you are trying to build it up faster, leave it out and feed every 12 hours. I know there is debate about flavor development in vs. out of the fridge. All I know is that with my baking schedule, mostly on weekends, it just makes more sense to keep it in the refrigerator and feed it a couple times a week. It may be true that the flavor develops more quickly with more frequent feedings, but even so, it should equalize within a few weeks whether you keep it on the counter or in the fridge. Followed the above directions for making (birthing?) the starter to the letter, and was just as happy as a clam until after the day 4 feeding. Then ... nothing. It sat there, and then sat there some more. 24 hours and ..still nothing. No growth. Not a bubble. Nothing. Decided to read the instructions again, and came across some nonsense about patience, and waiting, and blah blah blah. Then I thought, well this guy's done it already so decided to try such silly advice. I mean he says "wait, it will double etc. etc." right? 24 more hours, 48 total, and ...presto! ... nothing. Though I did notice the intriguing (!) smell had shifted to a sweetish, citrusy acidic kinda smell that was quite pleasant. That's all. No movement. Dead as a mackerel. Waited eight more hours overnight. Nada. Whatever. Set it on the counter and went to the dentist and ran around in town doing this and that. Figured I'd start over when I got back. Was gone maybe six hours. Came home, made supper, read a paper. Checked the dead starter. And we're talking about 62 or so hours now since the day four feeding. Voila! Almost double. Bubbles galore. Wonderful smell. Frisky as can be. Will feed again before retiring for the night. Onward! We got some sunshine for the first time in days, and the south-facing kitchen got nice and toasty warm. About 80 degrees. Perhaps that was what did the trick. David, congratulations on your new starter! And on passing the patience of Job test. You will find it well worth the effort once you start baking with it. Based on the discussions here and some of the experiences people have had, I edited the original post to note that from Day 3 on, the temperature shouldn't be too high. And I edited the dreaded Day 4 to suggest the addition of rye flour if the starter seems to stagnate at that point. Thanks to Debra and all of you for sharing your knowledge and experience! That is so funny...the Sourdough Starters it is ....our President is....drum roll....Phyl the gaaarp man ! So, today, while my little boy is napping, I decide that I will finally make my first loaf of sourdough. I've been keeping the starter at room temperature all week, feeding in the morning, and yesterday, I fed it twice. I measure out 4 oz. to make BBA basic sourdough bread. Knead it with my other ingredients, and leave at room temperature for what is supposed to be four hours, maybe a little longer before we refrigerate, and begin building the loaves tomorrow morning. Now, SEVEN hours later in an admittedly cool (about 66 degree house) it has not had any discernible rise. After kneading, I put it in a quart measuring cup, and pushed it flat so that I would be able to measure when it doubled. There are clearly many VERY small bubbles in it, but it has not risen. My plan is to leave it out, even until tomorrow morning to see what happens. Does anyone have any similar experiences? Should I not have waited 12 hours before beginning my build? Does the starter just need to ripen for a few more days with twice daily feeding? I am not particularly frustrated, but a little confused. You are describing normal behavior in a liquid starter. If your starter is 100% hydration (equal amounts of water and flour) or wetter, it sounds active and healthy. You judge the ripeness of liquid and firm starters differently. A firm starter (50-100% hydration) will expand, due to trapped CO2. It is ready to use when doubled or greater, with a domed top which may appear wrinkled. A liquid starter is ripe when it has lots of foamy bubbles on the surface. You may even see bubbles forming, growing and popping before your eyes. Because it is a more fluid medium, it doesn't trap the CO2. The bubbles float to the surface and pop, so it does not expand very much. I hope this helps. If you have a firm starter .... I am mystified. As for your intermediate starter, at that temperature it may take 10-2 hours (maybe longer) to rise and ripen, I think. Anyway, once it's doubled, I will build the dough, and give it a shot. Well, now it's resting in the microwave with the light on, and seems to be moving along. In the meantime, I've started a couple loaves of my favorite basic white bread, buttermilk version, this time substituting 10% white WW flour for whiteflour. I did the same as you are doing . Two days ago I got out the BBA and decided to convert part of my liquid starter to a "mother dough" firm starter per the book's inst. I have had a great liquid starter and I have been keeping it refrig. and only feeding it 1xw and keeping it a 1:1:1 ratio with unbl. bread flour. I followed the inst. to convert and it made a lovely kneadable dough. I set it to rise on the soapstone counter in my sunroom. I was worried that it was pretty warm there but decided after looking at it at the 1hr mark that it seemed to be flying right along. Indeed at the 4 hr mark it was more than double. I placed it in the fridge immediately and am planning on using it today. I think it needs to be used by ?3? days , can't remember and then refreshed. It has grown more while in the fridge and has some really large bubbles on the top of the dough. What recipe are you going to use with the firm starter ? I am still trying to decide. First time, just the "basic sourdough bread". All I've made so far with my starter are your "horse's mouth waffles." (Thank you for that one!) Now I want to try the basic sourdough to see how it comes out, and reassure myself that my starter is up to the task. My target loaves are the Roaster Onion and Asiago Miche, Pain Poilane (who doesn't have that on their hit list?? ), and I found a Desem recipe/technique on this site from JMonkey that I really want to take a whack at. Which recipes have you done, so far? Which are you most pleased with? I have used the liquid starter at 100% hydration to make the waffles 2 x and I have made 2 different kinds of baguettes. They were w/o any added yeast and they rose beautifully. I could have sworn they had yeast in them. Also they were not very sour but had a nice rich taste and great open crumb. I don't like sour which is why I keep my starter in the fridge. I have not used this firm starter yet. I keep futziing around today and have not done anything but admire how pretty lt looks sittin' there in the fridge. I need to go to the grocery and then get the show on the road. I have a cart that holds 90# and I pull it behind my bike to do all the errands etc. I rarely use a car anymore. I use my bread as fuel !! Are all of the 3 you listed from BBA? I have looked at the desem but not sure yet about doing it. Both the Roasted Onion and Asiago Miche and the Pane Poilane are in BBA. We'll see how she bakes......will bake sour dough bread tomorrow, and maybe prepare some sourdough pizza doughs the following day to put up in the freezer.......I've actually been dreaming of sourdough pancakes more than anything else though.......I'll be patient.....it will probably take time to develop a sour flavor. In an attempt to get a second starter that's a touch milder than my OR Trail, I started this process yesterday morning. It's the middle of Day 2, and the new starter has already doubled! I thought perhaps it was contaminated with some trace of Carl the OTS, but this new one seems to have the Day 3 reek, so I guess it's ok. I tried to grow a starter from scratch last year, and got nothing. gaaarp, thanks for these instructions. I have no idea why this is working so much better than my attempt last year, but I appreciate it. First of all, thanks for all this massively helpful advice. Wow! This is great. I've been following this over the last few days and am now on Day 3. I arrived home from work to find my starter is huge! It has way more than doubled - just as well I had it in a very large jam jar otherwise it would have overflown. My kitchen is pretty cool - 18 degrees C (except when I'm baking, obviously) and there was no activity before today. A very pleasant surprise! The smell is interesting, although not particularly disgusting or even unpleasant. Perhaps I'm just used to bad smells?!? As this is my first go, I decided to make a wholewheat starter. I now tend to bake a quick white sandwich loaf (for my wife) so this is intended to be for my "artisan" stuff and I thought wholemeal would be an interesting complement to plain white"quick" bread. It all seems to be working well so far (touch wood) - I'm expecting something to go wrong at any minute because things are never this easy! Well, I thought I was going to come home tonight and do the Day 5 addition, but it's barely grown since my Day 4 feeding. On this basis, I'm not going to feed it until it's doubled - I've just moved it from the kitchen (cool @ 18 C) to the living room which is a couple of degrees warmer. That might help, we'll see. I definitely got activity before so unless I've somehow killed it, I guess it's just quietened down while the enzyme activity is being replaced by yeast activity. I left it for 48 hours and still no movement. So I took a spoonful or so and added it to 50g of half rye-half wholewheat and 50g of water. Let's see how she does. I've been out all evening and after coming back there seem to be some bubbles at the bottom (glass bottomed bowl so I can see them). It had an ok taste before I refreshed - quite sour and not "off" but not sweet at all, so I'm hopeful it will come back! What temperature is too hot for a sourdough starter? I mean, what kind of heat can it take before it gets killed? They're dead :-( They're like a gummy, soft dough. I guess I'll make it into thin patties with diced onion and garlic, herbs, salt and pepper and fry it up in a little butter. Sheesh... What a learning experience ... but tasty. Gummy and soft how? Is it not bubbling anymore after feeding? What happens when you do feed it? Have you tried baking a loaf with it? What day are you on? I placed my starters on a baking sheet inside the oven with the light on. My kitchen's really cold and this usually helps to perk them up when I feed them. This time I forgot they were in there and turned the oven on. When I remembered they were in the oven, the starters had puffed up with a semi-solid surface and an internal temp of 140 degrees! My babies! So, I proceded to cook some up and eat it - it was great. It just sounds wrong though, doesn't it? ;-) They were almost 3 months to the day. Luckily I have lots of my grape starter left. Ah, I see. Don't worry. I almost did that to the sourdough pizza crust that I'm about to write about here. It was in my big red plastic bowl in the oven with the light on and I started to preheat the oven for my cheese sandwich for lunch. Luckily I got it out in time. Turned out quite nice. Greeting everyone! I am new to the forum as of, well...right now, and I have been working on baking my own bread for about three weeks now. I created a starter through a recipe in my Better Homes and Garden cookbook. It was basically just flour and water, then feeding it with honey later. The recipe said the starter would take about 24 hours to bubble, but mine was bubbling away and growing within a couple of hours! I live at an altitude of about 8,000 feet and wonder if this could be why? Right now my biggest concern is what is happening with the starter after a couple of weeks. It is in the fridge and I have only fed it maybe twice to three times since I started it. Tonight is has about a centimeter of yellowish clear liquid on top, and really smells strong like alcohol. I stirred it up, took out a cup, then replenished with fresh flour, warm water, and honey. I set it on the stove and it bubbled away for a few hours before I stuck it back in the fridge. It is beginning to take on a darker tan color when bubbling than before. Is it spoiled or spoiling? I'm on day 5 of starting a starter. I get bubbles, but no rise. The method I've been using required the rye, white, and water. on day 4 it said to throw away all buy approx a tablespoon and feed again. I don't know that I've seen it mentioned anywhere why we have to throw any of it away? does that help to concentrate the remaining? Just when it seems to be working (little bubbles) I end up throwing most of it away and there goes the bubbles. one method says - feed every 12 hours, the other says every 24 hours. is there a reason for either of these? I'm on my seond try and rising is not happening. I got the pumpernickel flour and the high-gluten for my second try but things seem to be slow. I wasn't sure what to do after 2 days with no rise on my first attempt so I dumped it, especially as Reinhart's book seems to assume it will have risen by then. This second attempt is a bit sluggish too, so I'm really glad to see this post! ..with some rye flour. It's got the goods for a more active starter. Room temperature also makes a BIG difference. My starter is really vigorous when the temp is over 72F but slower when the room temp is around 68F as it is today. I just put some dough in the 60F basement to slow the rise on my Friday night pizza crust and it will take about 4-5 hours to rise the same amount as one hour in a warmer area. Try building a sponge the night before because it takes little time and can deliver better flavor. You can always use more starter if you want and nobody will worry about it or arrest you. As long as you keep track of what you're doing in a notebook, you'll be able to repeat the successes and improve on the not so successful. If you want a book on sourdough, read the comments under the Book Review pages. There are a lot of good books and some people take to one rather than another. As long as your bread makes you happy it won't matter where you get your inspiration. Finally, if you want good sourdough recipes, there's a boatload in the sourdough pages of the Forum at the top of the home page. You may have to go through a few threads to find something that clicks with you. Just keep in mind that once you get how to bake that first good loaf, you'll realize that it's not that hard. Once you have the procedures down, then you'll be able to figure out a recipe on your own and convert non-sourdough recipes to sourdough. You can do it. for keeping a starter healthy and active. I've been tuning up my starter over the past few days. The acid-producing bacteria had gotten the upper hand over the yeast, with the result that the gluten just dissolved before the dough could fully rise. After two days of feeding nothing but rye and water, followed by a few days of feeding a blend of bread flour, rye flour and water, it is bubbly and active and smells great. House temps are in the mid- to upper 70's, which is ideal. I have a levain mixed up for tomorrow's bake and a smaller amount fed with enough flour to make a moderately stiff dough which will go into the refrigerator for storage until the next bake. Newcomer here and trying my hand with the starter. Two questions though: Is it okay to use whole-wheat flour instead of rye, and since the tempurature here isn't colder than 77F [air conditioning] what will probably happen? Alright, Day 14 of this confounded starter. I fed it and waited, fed it more and waited. Waited for a few days and very small bubbles appeared. I fed it again and it risen very slightly, so that gave me hope. Not enough hope because it stayed like that for two more days. Yesterday I was knitting in the kitchen when I realized just how warm it was in there. So, this morning I took half of the starter, fed it 1/4c wheat and 1/8c water, placed it in a clean pyrex measuring cup, and put it in the computer room, where it is always cool and somewhat sunny [with thick curtains on the window]. It was at the 2/3c mark, and now it is a good half-inch past the 1c mark, and it is FILLED with bubbles and smells so yeasty. I consider this as a success. The question is now, do I consider this as Day 4? Joey, I would consider it Day 4. You could probably treat it as Day 5 and be OK, but one more good feeding won't hurt it. Is there some reason for using rye flour in the beginning? I'm not sure if I'm misremembering but doesn't rye have less gluten or something like that? Anyways all I have is AP and bread flour. I made a starter before but i just tossed it because it never grew, even though it bubbled. Your recollection is correct: rye flour is lower in gluten-producing protein than wheat flour. But that's not why it is used in sourdough starters. Rye flour is also higher in sugars and, possibly, natural yeast than other flours. That's what makes it useful in jump-starting a sourdough starter, and why I often recommend to people to "goose" a sluggish starter with a bit of rye. You can certainly grow a starter without using rye flour, but in my experience, it's worth investing in a small bag of rye to get your starter going. Oh and also I was wondering if you guys knew what temperature range your fridge had to be in in order for it to be suitable for yeast to grow. 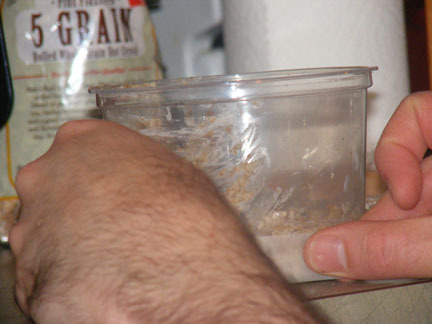 Sourdough starter can survive at nearly any refrigerator or freezer temperature. In fact, one way to preserve a starter that you aren't currently using but don't want to discard is to freeze it. As far as keeping it active in the fridge, according to Peter Reinhart, a starter will essentially go dormant at temperatures below 40 degrees F.
Hi Garp, I am trying your starter here in Thailand where the temperatures are usually in the 80's in my house. We also have a lot of extra microbe activity here in Southeast Asia. Do you think my starter will just turn into microbe mush or do you think I will be able to cultivate the yeast starter I am hoping to? Thanks so much! I think you'll be OK at that temperature. Keep an eye on your starter, though, as it may develop more quickly than the formula above states. Just be ready to move one when the starter tells you to. Good luck and keep us posted! Everything went fast, as you predicted. I am on day 5 and it is full of small bubbles but no longer rising. I am concerned that the high temps of my house (mid 80's) is going to inhibit the growth of yeast & that I'll just be using strange bacterial concotions to feed my family with. Any thoughts? As I think you've proven, it should do fine. Keeping it in the fridge is a good idea, getting it out to bake with and to feed periodically. Thanks for your help & quick replies :) My sourdough banana bread was yummy. So if starter goes dormant at 40 does that mean that your yeast will no longer expand and bubble? Or does it just retard it even more? If you know what temperature your fridge is at, could you please tell me? I feel like my fridge keeps my doughs from rising, so I could use some professional advice hehe. I don't know the actual temp of my fridge, but it should be below 40. The ideal temp is between 35 and 38. The fridge will definitely slow your rising down to a nearly imprerceptible level, at least once the dough is chilled. The dough will rise until it gets down to fridge temp. And the warmer it is going in, the more it will rise. So if you put a fairly warm dough in the fridge and check it after, say, three or four hours, it will have risen considerably. But if you check it the next morning, it may not have changed much. Hi, just reading about zora.aisling from New Zeland above as i too have recently just started a starter and hope to be making sourdough in a week or so. I trawled this and other sites to get the knowledge needed in order to get my starter going. Lots and lots of different ways and water/flour ratios including adding anything from grapes to pineapple juice! I decided that there was no way that i could follow one persons ideas or any particular recipie (as always) so i took the basics and started there, they said make a paste so i did, 100g flour 200g water, they said feed it every day by taking some out and replacing with fresh water or by doubling the original amount. I went with doubling as seemed less of a waste of flour so i doubled my small start of amount and again the next day. On day too it too looked like it was sitting in a puddle of water so i stirred it back in. On day three it smelt like tuna fish and pretty bad but it was fed anyway (they said it would smell bad and i was happy it did, mmm what flavour this must give to the bread!). So on day three after feeding about six hours later it rose by about a third of its volume so i asume on day four it will be double at least and almost ready for another feeding and the fridge. Maybe ill double up again or throw half and feed again. Who knows but the main thing is it was so easy to start and make and went like everyone said it would. I'm sorry i didnt stick to any one recipie or ratio but i knew that when i came to bake with it i would have to have some idea of how much flour and water the ratio was so i could subtract it from the bread recipie. I basically added 100g of flour to 200g water so if i weigh the amount of starter and it was 600g for example i would know that 200g was flour and 400g was water. I'm on day four feeding in a few hours so if anyone wants to critisize me and offer any help and guidance especially on my flour water ratios etc i would love to hear from you. Please don't hold back as i like different opinions and would help me troubleshoot when and if future problems happen. I started this on Monday night and forgot to add the flour and water last night, so I added it first thing this morning. It has now doubled in about 8 hrs. Is this ok? Should I just wait until tomorrow morning and proceed with step 3? Or should I start step 3 sometime tonight? I think either way should be fine. Personally, I'd wait until tomorrow and take it from their. Made a two loaves from a recipe I found and they had a great taste! Today is the day I plan on feeding my starter but I have a question. I weighed out the starter and its weight (minus container) is 235g. So that is how much flour and water in equal weight that I add? That seems like a lot of flour to add. Should I be throwing a portion out and then weighing? Just don't want to screw it up now that I have a starter! Glad to hear your starter is working well for you. Generally, you will want to discard some of your starter before feeding, in order to reduce the amount of flour you are adding and to keep from having an ever-growing volume of stater. There are lots of things you can do with your discards, from adding it to other bread recipes or pancakes to putting in your compost pile. There are a number of threads here that talk about what people do with their discards if you're interested. I keep such a small amount of starter that I don't feel the least bit guilty tossing it in the trash. is all about ratios, not about absolute quantities. It looks like you may have picked up a recipe that was increased by 10%. I followed gaaarps recipe and used 1/4 cup of starter out of it for the two loaves and that was it. I was trying to follow his instructions for feeding where he says 1 to 1 to 1 for a 100% hydration. Gaaarp for all the help. And even though the loaves I made were a bit on the "brick" side they had that sour zing I was wanting. So thanks again for this thread and the help. I would like to try my hand at making a sourdough starter. But I cannot find any rye flour here in India. Do you think the starter can be made using whole wheat flour? Any other suggestion welcome to get it going. Thanks. Thanks for your prompt reply. I will try it out. Your story does sound strange. You "should" be able to convert WW starter to "white" starter by simply refreshing the starter with white flour. I use King Arthur, but any unbleached, unbrominated flour either AP or bread should work. The yeast and the lactobacteria are there! The fact that the starter gets sour shows that the bacteria are present. I also use chlorine free water. I pass tap water through a carbon filter (Pur or Britta). My feed ratios are equal parts by weight starter, flour, water. I suggest you refresh some of that sour starter and make a loaf. Maybe, the loaf will rise in spite of the appearance of the starter. Question, and I know this is probably more of an art, than science. I added the "day three" to a nicely bubbling container, that was at about 3:00 p.m. It's not even 6 p.m. and it's doubled. Is that okay? It smells all nasty and sour and delicious, like rotting forest, I almost want to eat it with a spoon! Should I retard it somehow, or let it run it's course? As I read day 4 above, gaaarp says it must double first, so you may be ok. The way in which the instructions are given in this recipe are fantastic, I can't wait to give it a go tonight! From a person who loves bread but hasn't yet attempted sourdough, I thank you. I would strongly recommend a kitchen thermometer - I bought mine, a Salter one with a metal probe and a digital readout at Briscoes when I was in the city on one of those random days when they have 30% off everything in the store. Not only for keeping an eye on the temperature for your starter but also when it comes to bulk fermenting/proofing your bread, in our 'cold' homes it helps a lot to learn where the warm spots are on any given day. It's possible to make wonderful bread without getting too carried away in equipment terms, but I do think that a kitchen scale and a thermometer make a difference for me. Of course it's possible to work without a thermometer, just need to go with the (cold) flow and work with the dough as it reaches each stage of its development. btw I'm on Waiheke, where are you? I began my starter a few years ago in the middle of winter, when the kitchen temps were around 14-18C. I had a couple of false starts, and was starting to think the cold temperatures were responsible. However, with the online guidance of an experienced SD baker and a good online tutorial, I managed to get a lively starter up and running, and it's still with me a few hundred bakes later! The key, for me, was switching to a premium quality wholegrain organic rye flour as a 30% component of my starter feeder flour (the rest being plain white flour). I had previously been using 30% refined white(ish) flour and which was glue-like when mixed up with white flour and water. This switch made all the difference. The cold ambient temps did slow the progress of the starter development. Mine took about 14 days to reach baking ripeness, whereas starters begun in warmer temps can take much less time than this. Robyn's excellent suggestions will doubtless hasten the development of your starter, but just thought I'd share my experience with you as a reassurance that starters can thrive in cold temps without taking warming measures. Sometimes, it's good to have a precedent as reassurance. Here's to your first SD bake! If I'd kept track of exactly what I did when to the starter I got going about a week ago, there would be a nice write-up here complete with times. But I didn't. So I can't really do that. However, I can tell you that the first loaf of bread (that will likely be less than sour due to the very, very young age of my starter) is getting its bulk ferment right now. It's a tiny, tiny loaf of 75g starter, 150g water, and 230g flour. I keep my starter at 100%, so that means that the dough was 70% or so hydration. It's going to be the cutest little loaf. This is the third time I've used this method with success. Yay for success! Don't give up yet. Patience is a really important 'ingredient' when it comes to sourdough bread baking. Sometimes it takes longer for a starter to get developed, it's a matter of hanging in there and providing good conditions for the bugs you do want to get a thriving colony established. What's your water like? Is it high in chlorine? I really notice the chlorine odour in reticulated water when visiting friends and family because I'm on tank water, nevertheless I do successfully maintain my starter with their water.. If this is the source of the problem and as you are only a few days into the exercise it might be worth trying again, this time with either some bottled water or with some water that you have taken from the tap and left to sit for a day or two to allow the chlorine to dissipate. To test this you would be better to start afresh as your current mix may have been affected. I would feed both the current one with the usual water and a 'chlorine-free' water one, as there is a good chance that in a few days with some TLC (some warmth and a some wholegrain flour) your current starter will suddenly seem bursting with life, and if that happens you won't have to worry about fussing with getting rid of chlorine. This is a lot to read but you may be able to relieve some of your Mum-of-new-starter anxiety. I have just seen your last couple of messages here, sorry I missed the one last night. Great to hear your starter has started to show signs of life. Plenty of activity going on in there just not visible to us until there is sufficient gas produced to observe a change. As Stephanie says, feed it. I hadn't realised that you were not feeding it sorry. I've just gone back and re-read Gaarp's instructions - he suggested waiting a maximum of 48 hours before feeding at this stage (allowing time for the colony to get established before swamping it with more food). From what I understand you haven't fed it for more like 100 hours, the by-product liquid you are seeing let's you know that the waste products are building up and its really time to feed again. I suggest you go back and read right through Gaarp's instructions and look at his photos and you will see that your starter is behaving pretty much as expected seeing as it was a bit cold to start with. Well worth reading right through the comments here too. Just take care not to go the other way and overfeed, from now you will be establishing a balance between amount fed and timing of the feeds. The fact that you got some rise also means the level of chlorine in your water isn't a factor. As MC says, you need to use the starter, assuming it's ripe and active, around the time it's peaking. It will form a dome if it's not too highly hydrated. You want to use it then, or around an hour or so either side, at least...this window will open even wider if your room temp is cool. It's impossible to be more precise than this about the timing, because there are so many factors involved. Whatever, it's not difficult, and you have a good span of time during which your starter will work well leavening your dough. But is it really ripe and ready to go? Your description sounds promising - "creamy and bubbly" is good. There should not be an unpleasant odour if it's ready, though. Is it the consistency of mousse - ie: aerated and light with bubbles all the way through? Or is the bubbling just on the surface? If the latter, you need to keep feeding it a day or two longer until it attains that mousse-like consistency throughout. I'm assuming your starter is quite liquidey. If it's a stiffer starter, the mousse description won't be appropriate. For lower hydration, whole-grain flour starters, ripeness appears more as a sponge-like quality (visually) when you penetrate the surface, and the sponginess should be apparent all the way through the mix. And whatever the hydration or ingredient mix of your starter, it will swell and rise hours after a feeding. If it's not doing that appreciably, I'd say it's not ready. You know, you don't even need to knead. Another way to develop the gluten in your dough is with hourly stretch-and-folds. That could be a time-saver for you in your busy situation, although you do have to be physically present every hour or so to do it. The actual S&F only takes a minute. There are plenty of video demos of the technique on youtube: here's one that makes it all very clear. Finally, I reckon you might be well-advised to start off with a trusted bread recipe that will definitely work for you as long as your starter is a goer, and you follow the directions. Many folk, including me, have found the good ol' Norwich Rye to be ever-reliable, and it's an easy dough to work with. Link here. Maybe you've taken note of MC's comments re bulk proof and final proof times and have already salvaged that dough you mention in your last post. My kitchen is very cool at the moment - about 18C. I'm finding I've needed to extend my proof times far beyond those MC mentions to avoid underproofing, so don't under-estimate the importance of allowing adequate proofing times in cool conditions. If you weighed the ingredients exactly according to the recipe, the dough should not be dry. It's a medium hydration dough that should be easy to work with. I've made this one many times, so I'm not talking theory here. 2. It's possible you are using a very high protein white flour, which absorbs more water than lower-protein flours. Could you check the protein count on the packet and get back on this? 3. Since this is your first bake, maybe you've got a mix in mind that is more like a cake batter than a bread dough? Just a thought, but probably not a valid one - and one your mixer would protest about, by the sound of it. I always hand mix, so can't comment on that aspect of your post. If the dough is heavy going for your mixer after the autolyse, though, it's probably not a bad idea to just switch to hand to cut in the salt (I use a dough scraper) and give the dough a bit of a knead before transferring to the oiled container and beginning the bulk proof. Alternatively, you can hold a bit of the water back during the initial mix and dissolve the salt in it, then add the saline solution to the dough and mix in after the autolyse. 4. I'm surprised that your dough seems so dry, but whatever the reason, you can add water if your intuition tells you to - Mango Chutney's tablespoon-at-a-time recommendation is a good one. M. C. makes a good point, though, that beginner bakers do tend to think the dough is too dry initially, not anticipating that when it comes together it will seem more moist. This is intriguing! You've GOT to be close. Keep the updates coming. "M. C. makes a good point, though, that beginner bakers do tend to think the dough is too dry initially, not anticipating that when it comes together it will seem more moist." Actually, what I said was that beginners tend to make the dough too dry because they don't realize that it will get drier as they work it. Thus, they add more flour than they should and it is too dry later on. I was evidently projecting my own experience on to your comment, MC - and that appears to be contrary to yours! I only do sourdough breads, so maybe that's the reason for our different experiences here? Whatever, apologies for confusing your meaning. to rise in cooler temps... If you are waiting over 24 hours and it's not rising to your satisfaction, don't waste the dough. Spread it out and lightly wet it with your hand, sprinkle two teaspoons or so of instant yeast onto it. Roll it up and give it a few kneading turns then let it rest. After it has relaxed in about 30 minutes, knead it a little more to spread the yeast around, then treat it like regular dough, something familiar. Let it bulk rise until doubled and then degas and shape for your loaf. Let it final proof and bake. No crime in helping a new starter along. The new starter might not be strong enough in yeast concentration and there's a risk in waiting too long (2 days) a break down of the gluten while waiting for the rise. Long fermenting tests the limits on normal flour and that is why bread flour can be popular with sourdoughs. Adding additional yeast at this stage after some flavour has developed in the dough will make your life easier (by timing it) with less waste until the starter is stronger. You have just been too impatient, especially in a cooler climate. You need to dedicate at least 6 weeks to the process. If you come in under that, that's a bonus. Throwing it out after 1 or 2 weeks is simply throwing it out before you really gave it a chance. I know that a majority of starter tutorials give the impression that you'll be baking in as little as a week, but that only happens for a lucky few - let's call it the starter lottery. The rest of us have to go the distance and show a lot of restraint and patience. First, I agree with Keith. Patience is an absolute necessity! The temperature of the starter should be in the range of 70° to 85*F.
I cannot tell from your note whether you are continuing to feed the starter during the life of the starter. You should continue feeding the starter in the ratio of starter:flour:water - 1:1:1 by weight. Feed it once every day, some people recommend twice a day. You will need to discard some of the starter each time you feed the starter, otherwise you will end with a tremendous amount of flour paste. If you have already discarded the starter, then I recommend you try the pineapple juice method, otherwise just keep going with what you have. I also recommend you use chlorine-free water and unbleached flour (AP white, whole wheat, rye). No point in feeding the starter with unbleached bread flour. If you have not invested in scales, then a cup of sifted or gently spooned finely ground flour weighs 4.3 ounces (120 grams), and a cup of water weighs 8.3 ounces (236 grams). I also have just recentily began a sourdough starter combining W/meal spelt and white bakers flour. My old starter after being ignored for a very long time. The starter came alive on the 5th day and I was baking by the 6th day. These loaves are my 3rd lot of loaves using spelt. However it is my Ist attempt at a spelt sourdough loaf . Day 1 Originally I mixed to a slurry 50grms of white bakers flour, 50 grms of wholemeal spelt flour and 100 grms of unsweetened pineapple juice. Day 2 I added 50 grms of white bakers flour with 50 grms of unsweetened pineapple juice. Day 3 I now took out half of the starter(no sign of life as yet but day 3 is early) and fed another 50 grms of both of white bakers flour + pineapple juice. Instead of throwing out the excess starter I began another one but feeding it 50 grms of both W/meal spelt flour + pineapple juice. Day 4 I now see small bubbles appearing along the sides of the jar and on top of the surface. I was confident we were under way knowing that the mix was not yet ready to begin baking with. Another feed repeating day 3 but throwing away the excess insteading of growing another starter. A pungent yeasty beer smell was now in the air when I removed the lid. Day 5. We have lift off. The first starter grew over night to a point where it came out of the holes in the jars lid. It is a bubbling thriving mass of sourdough starter. I will only feed this on White Bakers flour from now. The 2nd mass also grew but it was in a bigger jar. It had doubled in size. I will now go back to feeding this one white bakers flour with every 3rd feed using spelt flour for a different flavour and approach. I am also confident I can now replace the pineapple juice with water for future feeding. Althoung it was a young starter it was so alive I decided to bake. This mix was placed in my bread baker and set on the knead only setting. When the cycle stopped I turned the machine off and let the dough rise for another hour as S/Dough starter is slower to rise than instant dried yeast. I then removed the dough from it's kneading basket and divided it into two on a floured surface. I gave both dough's a small stretch and fold and shaped them to place in a traditional sandwich loaf tin. They were then left to proof for the next 6 hours and cooked at 200 Degrees for 40 minutes. The result was 2 X 500grms sourdough loaves, my best to date. Although a more mature taste has yet to come from the starter I was surprised that such a young starter gave good proofing and oven spring . The crumb was light in texture and taste with a chewy crust. Next time I will use 5% less hydration in the recipe hoping for a slighty denser crumb. Based on my first efforts using Spelt Flour I am happy. Is there any reason or benefit in using rye flour to initiate a starter? Can starters be initiated by using AP, Bread, or a High Gluten flour? Reinhart's "BARM" formula/recipe. It failed three times, then I realized that I was on a time table and starters have their own time table, right? Rye flour is quite different than wheat flour, in terms of its chemical constituents. Those differences seem to benefit the yeasts and bacteria that we want to culture in a sourdough starter. That said, one can initiate a starter with virtually any flour, including those you list. Some will ferment and stabilize more quickly than others. Whole grain flours, whether wheat, rye, or otherwise, seem to launch a starter sooner than their white equivalents. My untested hypothesis is that by removing the grain's outer sheath and bran layers during white flour production, many of the microorganisms are also removed. Similarly, if the flour has been bleached, many of the remaining microflora die as a result of the toxicity of the bleaching chemicals. Finally, I suspect that the outer layers of the grain, along with the germ, contain nutrients that are beneficial to the yeasts and bacteria that we want to cultivate. Those, obviously, are no longer available in a white flour. As you read about sourdough starters here on TFL, you will come to realize that feeding regimes are every bit as varied as the people who use them. Some are very rigorous about flour types, hydration levels, temperatures, or maintaining multiple starters for specific purposes. Others are more flexible. Many maintain a single starter, fed primarily with one type of flour, that they adjust to fit specific requirements. For instance, I typically feed my starter with AP flour. If I need a rye starter for a bread, I will feed it with rye flour for 2 or 3 refreshes. By that point, it is nearly indistinguishable from a starter that has been maintained with nothing but rye flour for its entire life. Although Reinhart's directions in BBA for beginning a starter are predicated on Debra Wink's pineapple juice method, he makes it rather more complicated and wasteful than it needs to be. Not to mention the misuse of the word "barm". Use the Search box at the upper left-hand corner of the page to search for pineapple juice solution. Read Parts 1 and 2. Part 1 gives a very good description of what goes on inside a starter and Part 2 provides a very effective method for beginning a starter. Best of luck with your new "pets". There is a lot of conflicting information out there and confusing to say the least. My failed attempts at making a seed-culture with pumpernickel flour using Reinhart's BBA formula/recipe caused me to try one with KAF High Gluten Flour, Sir Lancelot (14.2%). Too, PR replied to my email questions telling me to be more patient. That's when the next culture made it to starter stage. But down inside of me was that failed feeling about the rye flour. So, here just recently I tried again using pumpernickel initially and then high gluten flour, as is called for in the BBA. It came through finally but had me very concerned for a few days. I have to teach myself to be more patient when it comes to "sourdough.? Without yeast sourdough really sets its own pace! Then too, I recently read a paper by a "Doctor G" who shared a very good fact, as you mentioned, about 75F to 90F. I set my proof box (Brod & Taylor) at 85F now and watch things happen so much sooner. But then again, right now here in Oregon things are a bit cooler - if you know what I mean. Your mention of the use of the word "barm," PR did mention, and wrote somewhere, how he came to using that word. It would seem that he got the word from his "sourdough mentor" Ms Monica Spiller, who from what I can read is quite up on sourdough. She being English used it cuz of being raised with it. But when PR used it in a book I guess she mentioned to him what the word BARM really is. Further you mention that the BBA "directions are complicated and wasteful." Would I love to be able to pick your brain. I know this is not the medium for "back and forth." Such is life, eh? Last but not least, I am even as I am writing here, doing another seed-culture using only "high gluten (KAF, Sir Lancelot flour). Seems it is slow to get going. Slower than I remember from when I last tried it in July and August. But, as you said, my pet is continuing it path. Lest it be at its own pace, eh? Thank you for your reply Paul. For sure, you seem to have a very good grib on this thing called "SOURDOUGH." Really a great article and very simple lesson on making the starter. Thanks for taking the ime to do that. What I would like to know is what your basic recipe for your bread is. If it's not a family secret I would appreciate your sharing it with me. I just moved to Idaho at about 5800 ft. and tried to get a starter going, for the life of me nothing was happening. I then doubled the H20 and now the starter is going gangbusters. Only thing I can figure is either altitude, or the extreme dry here. Your starter is slightly different from my starter. I start out the say but sub two tablespoons of water for 2 tablespoons of pineapple juice, or brown rice syrup, or even maple syrup. The yeasts that are present in the flour and in the air love sugar and by adding a sweetener to the initial starter for the first, three days, it creates a more robust sourdough starter then just using flour and water. This same technique can be used for gluten free sourdough baking too but I often tell those bakers to start small and exclude water. For gluten free sourdough start with two tb of rice flour and two tb of sweetener. Each day double the amount of gf flour and sweetener. By the third day you will have a robust sd starter. Another issue I have with this thread is the plastic. When I made my first sd starter years ago the first lesson I learned was never to cover a new starter with plastic. Put it in a glass jar and, after mixing, it should be covered with cheese cloth. This gives all of the wonderful yeast floating around in the air a good opportunity to find the dough that hasn't soured yet and allow them to do their magic. Cover with plastic and you stand a good chance of suffocating the yeast before they have a chance to do their job. This is one reason why a lot of sd starters never start. Anyway, this is just my two cents but I've never done it this way and my starters have always been robust and highly active. "This gives all of the wonderful yeast floating around in the air a good opportunity to find the dough that hasn't soured yet and allow them to do their magic. Cover with plastic and you stand a good chance of suffocating the yeast before they have a chance to do their job. This is one reason why a lot of sd starters never start"
When you create a starter by mixing flour and water you are activating the yeasts and bacteria that are already present in the flour itself. You are NOT capturing wild yeasts in the air in any practical sense. The yeasts and LABs are on the grains when they go into the milling machine and thus end up in the flour. You will find, if you do the experiment, that you can make 2 starters side by side and keep one in a glass jar with the lid on, and one in a glass jar with the lid off, and both will proceed identically with no problems (save that the one with the lid off will tend to dry out quicker). The idea of suffocating the yeasts is also flawed as within that damp mix everything is sealed off from the air above. Yeasts DO thrive better with an availability of oxygen which makes them reproduce aerobically rather than anaerobically. The best way to increase oxygen in the mix is to frequently stir it. I've made all my starters using either glass or plastic containers WITH the lid on but leaving the lid just a tiny bit loose in order that built up CO2 can escape instead of it building up huge pressure. My advice to you is to dispel the romantic urban myth that creating a wild yeast starter involves "capturing wild yeasts floating around the air" and understand that 99.99999% of them are already in the flour. Anything from the air is negligible. Actually ElPanadero, it's not really incorrect. There is yeast in the dough and there is yeast in the air. You want to capture the yeast in the air as well as the yeast present in the dough. I have seen many a starter die when someone suffocates it by covering with plastic. And just have a chat with Peter Reinhart and he will tell you that it is the actual yeast in the air that we want to attract. This is why many starters add some form of sweetener initially. It's the attract the wild yeast in the air so they will mix with they yeast in the dough. I'm not here to argue. And no, 99% aren't in the flour. There's a very small amount of yeast in the flour but there's a lot floating around us. By leaving the cover off, as you mentioned, you do two things. Allow gas to escape and create an opportunity for wild yeast to find the starter. This is why I cover all of my starters with cheesecloth. Wild yeast can penetrate the cheesecloth. Oh, and for the record, the famed San Francisco Sourdough Yeast, which has a specific name, isn't found in the flour. It's in the air. "Actually ElPanadero, it's not really incorrect." It is, and quite badly so in some respects. "There is yeast in the dough and there is yeast in the air." Yes correct however the yeast in the air in your kitchen is negligible. The yeast in the dough originated from the flour and in turn originated from the grain, from the mill and from the field in which the grain grew. "You want to capture the yeast in the air as well as the yeast present in the dough." 1. They are the yeasts NATURAL or NATIVE to that grain/flour. In other words those yeasts have long since formed bond with the grain in the field. They live and flourish naturally together and will have done so for years. 2. Every time you feed a starter you add more of the NATIVE yeasts that are in the flour you are feeding with. Over a period of time and feedings those natural yeasts will come to dominate the starter. If you try to put anything else in the mix it will compete with those native yeasts and your starter will most likely suffer as a result. This is exactly why, when you first create a new starter, you go through a 1-2 day period of bad smells. It's the period when the "bad" bacteria (leuconostics) that were already present are active. However because they are not NATIVE organisms to the grain they are unable to survive in the low pH environment that soon gets established and so after that smelly period they die off and the natural yeasts and labs flourish. "I have seen many a starter die when someone suffocates it by covering with plastic." This really is a total nonsense. It's worth just thinking this through. If I were to put you into a tank of water and push you to the bottom, you would suffocate and drown. It would not matter one jot whether the tank was open to the air or had a plastic covering since you are at the bottom, sealed from any air by all the water around you. It is the same in a starter. All the yeasts below the top surface of your starter would die if your theory were correct. The fact is that they don't and starters absolutely do not die as a result of being covered in plastic or any other covering. "And just have a chat with Peter Reinhart and he will tell you that it is the actual yeast in the air that we want to attract." If he truly believes that and that most of the yeast is not already in the flour, then he does his reputation significant harm imo. "This is why many starters add some form of sweetener initially. It's the attract the wild yeast in the air so they will mix with they yeast in the dough." Where did you get this notion from? Adding "things" over and above the flour and water is mostly counter-productive because what you add will invariably compete with the yeasts and labs we want to flourish. An exception to this is adding something that will help to quickly lower the pH of the mix such as fruit juices. Doing so reduces that leuconostic period I mentioned above. The flour provides plenty of sugar and food for the natural yeasts and labs. Nothing else needs to be added. The more important factors for success are the temperature you keep it at and the time you leave it to do its thing. "There's a very small amount of yeast in the flour but there's a lot floating around us. " Not that is simply not true. There are significant amounts of yeast in/on the grain (you can Google the scientific reports concerning this). If you really want proof, take some flour, dry fry it in a frying pan (to kill off any natural yeasts) and then mix the flour with water and leave it open to the air and see how long it takes to make a starter. This is an experiment I have conducted myself. What you get is a dead mass that doesn't change despite being left open to the air on a counter top for days. It eventually will go mouldy. "and for the record, the famed San Francisco Sourdough Yeast, which has a specific name, isn't found in the flour. It's in the air." You're confused a little here. Take note that no-one is saying that natural yeasts are not airborne. In the field of wheat the yeasts must be highly concentrated in the air. As I said earlier, specific yeasts find that the grain is a habitable environment, if that were not the case they would not survive. In a mill the air is filled with flour dust and thus it has a high concentration of airborne yeasts. The end result is that the milled flour is highly populated with those yeasts. I will offer you one further experiment to conduct to help you understand that the yeasts are native. Take a glass jar, fill it 1/3rd of the way with raisins and then fill it 2/3rds with water. Put a lid on the jar so no airborne yeasts can get in. Then just leave it. In a few days the yeasts that were ALREADY PRESENT on the skins of the raisins will grow and multiply and you will see CO2 bubbles being given off. This process is much quicker than flour based starters. What you will have created is a Yeast Water. According to your "theories" this can't work because a) the yeasts would suffocate in a closed jar and b) there wouldn't be enough yeasts because we haven't left it open to the air. You will soon see that both of those notions are simply misinformed. Can you explain this attraction of the airborne yeast to the sweetener? Is it like a yeast magnet? How do you come by this 99% number? Has someone scientifically counted the yeast cells? It most certainly is in the flour. It settles on the grain in the wheat field, whether the wheat field be in California, Kansas or Italy. It's in the air all over the world, not just San Francisco. There is no species or strain of yeast specific to San Francisco. If that's what Peter Reinhart thinks, it seriously calls his credibility into question. I've made numerous starters with no sweetener in Los Angeles, California, well outside of San Francisco, which were covered the entire time and the yeast did not "suffocate". The yeast were able to reproduce just fine and they raise a loaf of bread equally well. ElPanadero is correct and practical experience directly contradicts your theories. Hi all, I am a beginner baker and only recently ventured into making my first sourdough starter. I just want to thank the OP for such a noob-proof tutorial which I think I will try if my current starter doesn't work. I was wondering if anyone has advice on the smell of the starter? My starter is almost 7 days old now, and it has been bubbling up and at least doubling in size between feedings. The texture also seems OK, like pancake batter. But it has been pretty smelly, almost like vomit, since about Day 3. I tried to look through most of the comments here, and it seems like a starter is supposed to get over that "stinky" stage by the 3rd day or so. Does the unpleasant smell indicate too much bacteria, and insufficient yeast? Or has anyone succeeded in baking bread with a stinky starter? I live in a warmer climate, so on average room temperature is probably 28-30 decrees Celsius. I've been putting my jar of starter at the window where it can hopefully benefit from a cooling breeze... But I've read that the warmer temperature doesn't help yeast growth. I was wondering if that could be the cause, and I might need to resort to the fridge? I would start over, and when you do so, let the starter stand out warm the first day, then keep it wrapped in a wet wrung out towel to lower the temperature the rest of the week. What is your water pH? If high, you might want to feed less often so the starter can build enough acid to lower the pH. Or try using bottled water with a lower pH. i think the water pH here is probably close to neutral (slightly acidic), it's drinkable from the tap so I think it can't be too acidic or adulterated. I started out feeding only once a day, but that seemed to be worse because the starter seemed to eat up the feed really fast and the smell was even stronger. Whole wheat can sometimes smell like stinky ol sport socks. What flour did you start out with? I'm not too far away, In Laos, the high has been 36°C and it drops with the mountain air at night to 22°C. I tend to look at the water when the flour can't grow yeast quickly. Although I would like to know if radiated flour works for making starters. Some areas of the US have alkaline water and that presents problems. Try using boiled or day old water (stand out with a loose cover) and see if it helps. By the way, where is most of the activity going on in the goop? Any areas will less activity or separation? Meanwhile, start a new starter and keep it away from this one, be careful to use separate spoons and covers. I used unbleached bread flour, based on a book i was reading... I will probably try making a new one using other types of flour once I recover my resolve to tackle this again, aha. I'll try the boiled water too. I also thought another possibility was that I wasn't developing the gluten in the dough properly hence the lack of rise. Because while the dough was bulk fermenting and covered in cling wrap, I noticed that the cling was becoming foggy, which seemed to me like there was some sort of activity taking place, but the gas might be escaping instead of being trapped in the dough to rise it?? (just guessing) I might do a bake with commercial yeast as well to determine if it was 100% a starter problem. Ask someone else what they think it smells like. Sometimes just skipping a feeding helps. Try a 1 to 10 test, it should react predictably at 24°C to 26°C. Take 10g of starter, add 100g flour and 75g water for bread flour or 65g water for AP wheat flour. blend into a soft dough and pack into the bottom a tall narrow glass or jar, cover. Mark the level and give it 4 hours before it starts climbing the walls marking every hour or two hours. Do this test when you have a 10 hour block to watch it. If it is ready for baking, it should peak in activity around 8 to 10 hrs. The jar should have about 5x the starter volume to avoid messy run overs. If the test is successful, plug it into your recipe or take 150g of the starter and make a 910g loaf. The heat here (high 90°'s in shade) climbs a little bit each day. It is dry and hot and we report every bush fire we can see. Lots of smoke haze in the air and I've read it's common this time of year. Heat usually peaks out middle of April and is celebrated with a Water Festival all over Laos. "Keep your travel documents and electronic valuables in sealed plastic." I've been told. I'm hoping to get my pool project done before then. Can't seem to find a power digger that isn't working on a road project. Digging by hand in this heat is dangerous, unless... we did most of it at night ??? So how was the loaf? How did it taste? Well... the loaf was a total bread failure so I suppose I can 99% conclude that the starter was wrong. The crust formed ok (and actually looked/smelled pretty nice) but when I cut it open it was more or less undercooked dough. There were virtually no holes to speak of so it was just this dense mass. I wasn't sure if it was safe to eat so I didn't try it. It had a tangy, not unpleasant smell. I have a photo of the cross section which I can upload later (in case this depressing account is insufficient for a diagnosis...). By the way when you say folds I assume you mean the "envelope" sort of folds? or do you do the "slap and fold" (sometimes also referred to as "stretch and fold") Richard Bertinet-style ? I've seen different tutorials expounding either method for wet sourdoughs and they seem to be wildly different (the former being particularly gentle, and the latter violent). So I don't really understand which one should work and why. Good luck on the pool project!! The haze and random bush fires sound pretty dangerous. It happens in the Sumatra forests nearby (both nature- and man-initiated fires...) and it looks like a pretty bad condition to live in. Are you in a city or rural area? The Water Festival on the other hand sounds really epic. During the bulk rise, and if my final proof looks sloppy, I just might envelope fold the dough again and reshape. Works miracles! I do like to slap and fold strudel dough, but the amount is so little it isn't therapy or a full kitchen workout. Slap and fold is more common in the early steps after mixing to develop the gluten before any rises. Later into the fermentation, slapping sends shock waves through the dough and bursts every bubble. I don't think anyone slaps and folds after substantial bulking of the dough. I will try the gentler envelope folds next time. I may have done a bit too much of the slap and fold last time (because the dough was just not developing the way it should have..) (and admittedly, because I find the slap and fold really fun and satisfying to do). ...but I just wanted to update you that just a few days ago, I managed to bake my first successful sourdough loaf! I was really stressing out (as I am prone to do whenever something doesn't work out, I'm ashamed to admit) but eventually I decided to chill out, and it seemed to have a positive effect on the sourdough starter (haha). You were right about the smell - after numerous feedings the starter stopped having a terrible smell, and even started to smell nice! I went with the no-knead recipe from Breadtopia eventually, because I wanted to cut out another potentially problematic element (my atrocious kneading) and it all went beautifully until I flattened the dough entirely when I was trying to put it in the oven. The end result was so deliciously chewy though and I'm so so happy with it (and I still consider it a success! ha). Anyway, long story short, I just wanted to thank you for taking the time to give all your tips and advice, which I believe contributed a great deal to this successful loaf! As to Hector, yes, the pineapple flavor will dissipate after several successive feedings of flour and water. Ugh this is the 2nd time I've failed on day 4. Both times, by day 3 I've had a beautiful bubbly risen starter and than once I add day 4 ingredients, it stops rising! I waited 24 hours and it had risen a little bit but nowhere near double so I added the extra flour and water 10 hours ago and it hasn't budged! Should I give up?? I'm using whole wheat flour and than plain white. This is perfectly normal! Day 4/5 is where most people give up. The first bubbling up is not the one you want. It is the leuconostoc stage. Bad bacteria. Then you feed it again and all seems to go quiet. But rest assured things are happening. Your starter is "sorting itself out". This is when people normally go into hyper drive and feed it more to "encourage" it to wake up again. This will be counterproductive. Now you wait. Only feed when you see activity and until then give it a stir every 12 hours. Once it starts to show signs of life then you start feeding again. Follow this procedure and your starter will wake up, get stronger and eventually bubble up on cue. Then it's ready. It might not go from nothing to doubling just like that. You are looking for signs of life in the form of bubbles. Starters are funny things at this stage. It might wake up slowly or after a longer dormant stage it might bounce back to life. Just follow the procedure above. If nothing happens and it begins to get a bit whiffy then instead of discarding and feeding as normal just give it a teaspoon or two of fresh flour to counterbalance the bad bacteria. If it begins to show signs of life, and is stronger, then go back to normal feeds and wait again. When it starts to smell nice and it's predictable you are ready to bake with it. and don't give up. I don't know your room temps but get the starter up to at least 24°C or over 75°F and skip a feeding. I'm very new to sourdough but very keen to succeed. I am in the process of making my own starter but am confusing myself by reading too many differing articles. I'm on day 2 of the process. Some say to toss out half of the original from now on. Some don't mention throwing any out until later on. Some say it's essential to throw out to assist in the yeast development. In which case why do some don't even mention throwing any out? Also I've started off with 75g of flour and 75g of water. 48 hours later and bubbles are forming. I haven't thrown any yet but have added another 75g of both flour and water. This is based on the recipe on the Hobbs House Bakery recipe. But the above tutorial (which seems incredibly helpful and informative and I intend to follow from now on) doesn't suggest equal amounts of flour and water on each addition. Another recipe says the quantities aren't as important as it is to make sure each time you are doubling the amount you've started off with, hence throwing half away before adding that same amount of flour and water 50/50. Argh! I know maybe the conclusion is that there are lots of methods and all are fine but I'm just struggling to understand the science behind it and feel confident in what I'm doing! The initial bubbling up happens quite quickly within the first couple of days. This makes the beginner think that this is quick and easy but it's a false start. Bacteria you don't want. Then after the 3rd, or 4th, feed everything goes quiet. At this stage the beginner thinks they've killed the starter and begin a feeding frenzy to 'wake' it up. It is at this stage it's counterproductive to over feed. Even though things have gone quiet something is happening. The starter is becoming acidic, killing off the bad bacteria and making a good home for the good bacteria and yeasts. Overfeeding and this stage raises the PH level slowing the process down. So while the good bacteria and yeasts do benefit from a good feed it's important to time these feeds well. Once your starter begins to mature and wake up then you return to regular good feeds. After all if there is no activity then what are you feeding? So get through the first stage with scheduled feeds. When things slow down then the feeds slow down. Just keep warm and stir. You may have to skip a feed or two (or even three). When it begins to show signs of life again then begin feeding again gain allowing the starter to dictate how often at this stage. Once your starter is strong and predictable then it's done. So healthy feeds are important at the right stage after all if there is no activity then what are you feeding? Keeping your starter warm, feeding with wholegrain and patience is the key. I hope you can help me. Twice I have followed your instructions and the starter has failed at the same step--day 4. Everything is fine on day 3, the I add the APF and water as directed (after getting rid of half the starter) and wait. In 24 hours nothing has happened so I wait 48. Still no growth. I add the extra rye flour and wait. Nothing happens. What am I doing wrong. I've tried 3 or 4 different recipes and none have worked. It can't be that hard. Any ideas? Give it more time. Patience is a virtue, and a necessity, especially when creating a starter. Keep going - personally - I think you're less than a week away from an active starter. Then about another week for bread ready starter. Good luck! Keep warm at around 78F and stir. Do not give in. I'm now three days past day 4 and the starter appears to have a few bubbles but has not grown. I've stirred it a couple of times a day and am keeping it in the oven with the light on (78 degrees). Should I add more flour and water per day 3? The only thing that keeps me optimistic is that it smells like sourdough. I think wait a bit longer. Another 24 hours? See what happens. Sounds promising. If in 24 hours you see a little more activity then give it a feed of 1:0.5:0.5 then wait again. If it really springs to life then 1:1:1. I don't understand the feeding quantities. Would it be 1 part flour to 1/2 part water and then 1 to 1? The starter starting is becoming more of an art than a science. That feeding is 1 part starter by half part water and half part flour by weight. Since a starter is a living thing it has to be nurtured. No two are exactly alike and one can't predict exactly how it'll behave at this stage. Once mature it will be more predictable but one will always have to go by feel somewhat. Right on schedule. I would feed less often, if twice a day, try once. For a few days at least, and no need for discard unless you have a bathtub full of starter. I find, with a white flour starter in particular, daily discard/feeds seem to dilute things which makes things go slower. Once it's very active it'll require the new food, in the early stages it really doesn't which creates dilution. Almost there! The initial bubbling up happens relatively quickly. The next feed or two you might find it reacts on cue. However starters do go through a quiet period when all seems to go dead. You have not done anything wrong, this is normal! The bad bacteria is dying off and the starter is turning acidic creating a good environment for the good bacteria and yeasts. The quiet period may last as day or two or even three. Best advice to feed only when you see activity. If not activity then keep warm and stir missing a feed or two or even three. Patience is the key! When it begins to show signs of life then carry on. Here is what i would do when creating a starter. Mix in equal parts by weight some flour (including wholegrain) and water which has been boiled and cooled. Keep warm (78F is an optimum temperature). Then wait until it bubbles up which can be anything from 12 hours to 1 1/2 days. Then I'll discard 2/3rds and top back up. Again I'll wait until it bubbles up. It may react again quite quickly and as strong or it may be slower and weaker. As long as there is signs of life all is good. When it seems to have done all the bubbling up its going to do I'll feed again. At some point you'll feed it, as above, and all will go quiet. Normally the third or fourth feed. At which point I'd stop feeding, keep warm and just stir. This quiet period can last for days! So be prepared for a waiting game. Every 12 hours give it a stir, keep warm and wait! When it begins to pick up again then continue feeding following the rule to only feed when it shows signs of life. From here onwards it'll gain strength and pick up speed. Once it is strong and predictable I'd give it some greater feeds and then after a few of those I'd bake with it. After which you'd store it in the fridge and find a good maintenance schedule. On day 4, the starter did not double after 24h. I waited 48 hours and it still not doubled. I have added 4 tablespoons of flour and some water, as per the instructions. I have waited another 24 hours and the starter doubled in size this time. According to the recipe, on day 5, the started should double within 3 to 24 hours. It's been more than 24 hours and it did not double (it almost doubled but then it went back to almost the initial size). So the recipe does not say what to do next in this case. Please advise. 1) My starter has a hard time doubling. I keep it in warm temps and feed 1:4:5 with 1/5 of the flour being whole wheat (FWSY recommends). I use 20g starter in my feedings with water at 90 degrees. Should I use more starter? Should I do 100% hydration? 2) How often should I be feeding? FWSY says every 24 hours but then I've read every 12 hours.